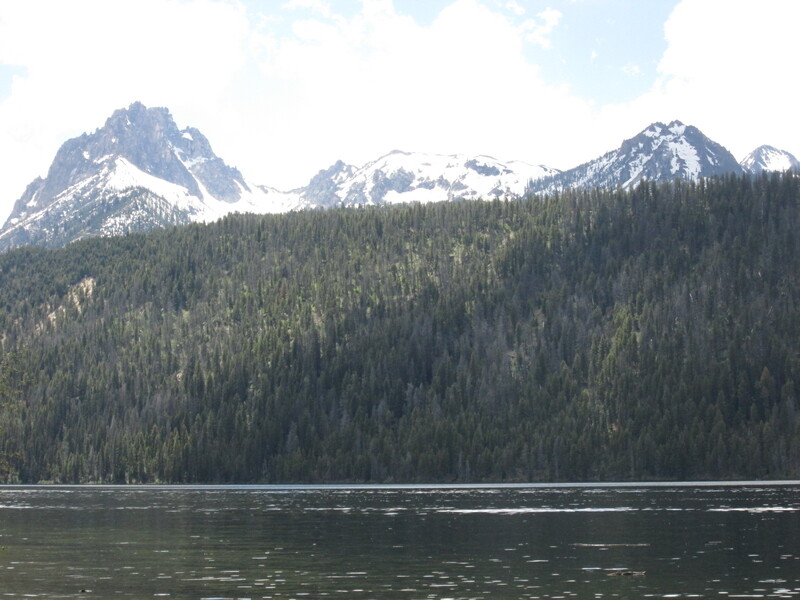 Idaho’s Sawtooth Mountains, from Lower Stanley, on the Salmon River. The chance to witness 2017’s total solar eclipse, virtually in my own back yard, was an exciting surprise. Totality could be viewed only 15 miles north of my home in Bellevue, Idaho, and I expected to enjoy it with family and friends. It soon became apparent, however, that I was the only person in my circle who was excited about this. Thanks to excessive media hype, most folks planned to just hide out at home and avoid the crowds. Well, 99.77% totality, literally viewed from our own backyards, may have been good enough for them, but not for me. I have witnessed many eclipses, but never Totality, and I wasn’t about to miss this! 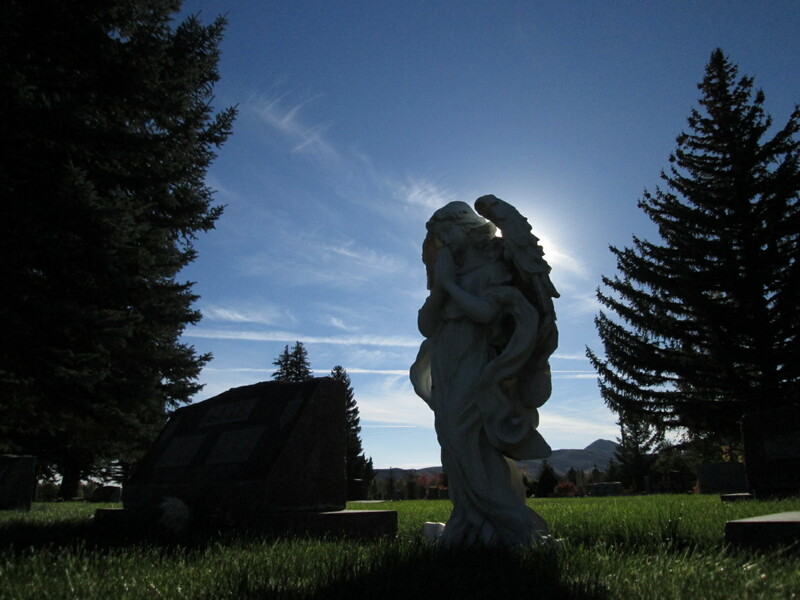 Like my family and friends, I had no desire to put up with crowds and traffic so began looking beyond Ketchum and Sun Valley, the two nearby towns where Totality could be viewed. 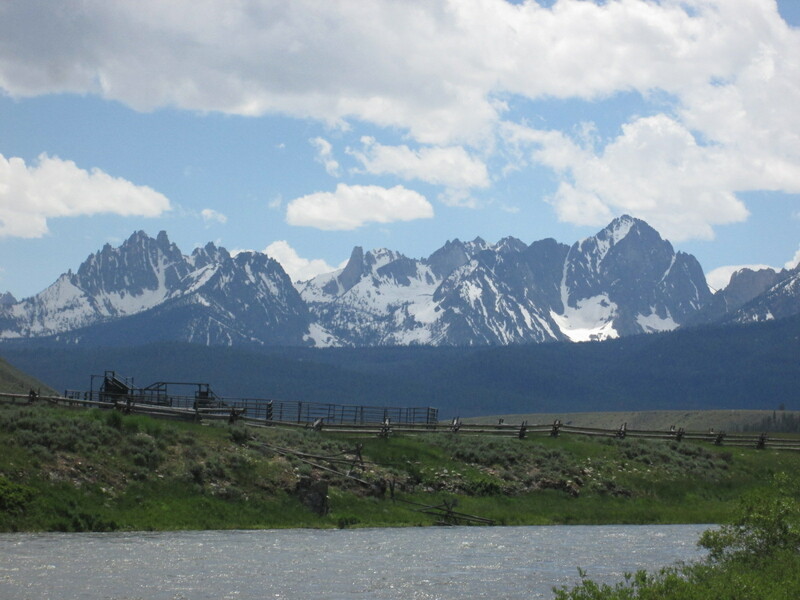 Instead, I chose the strikingly beautiful Sawtooth Mountains, just over an hour’s drive north. After searching satellite images, for a vantage with as many visual attributes as possible, I settled on a high altitude lake. 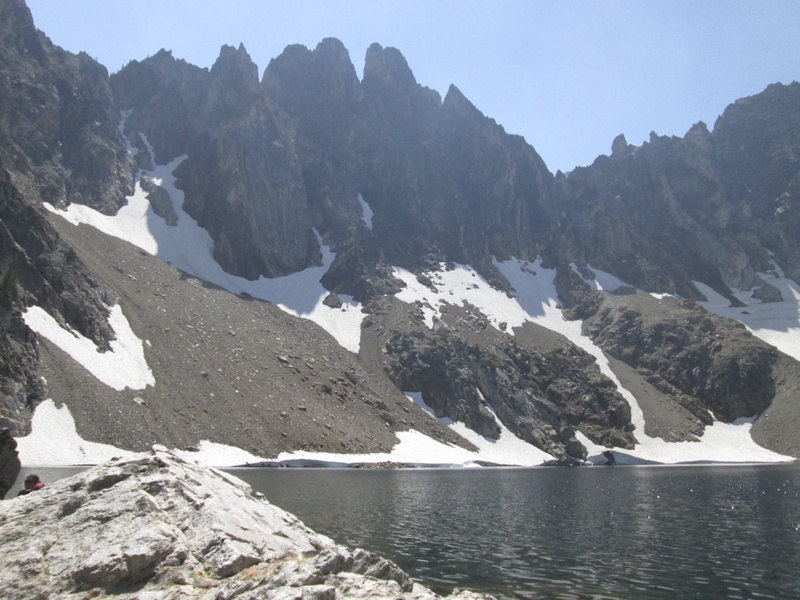 Situated in a cirque, between the rugged spires of Thompson Peak and the pyramidal massif of Williams Peak, this would require more than a casual drive and a place to park. 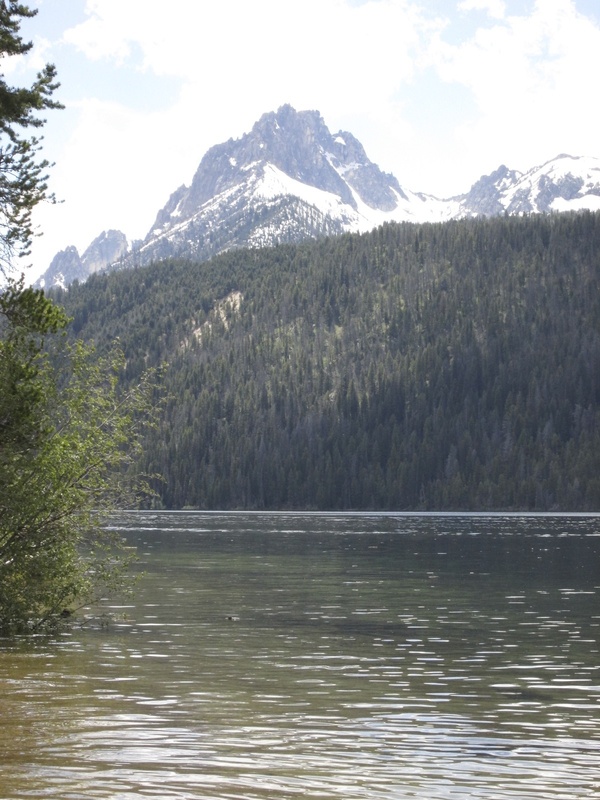 Known as the American Alps, the Sawtooth mountains are considered by many to be Idaho’s most picturesque and are heavily laden with lakes of every size and shape. 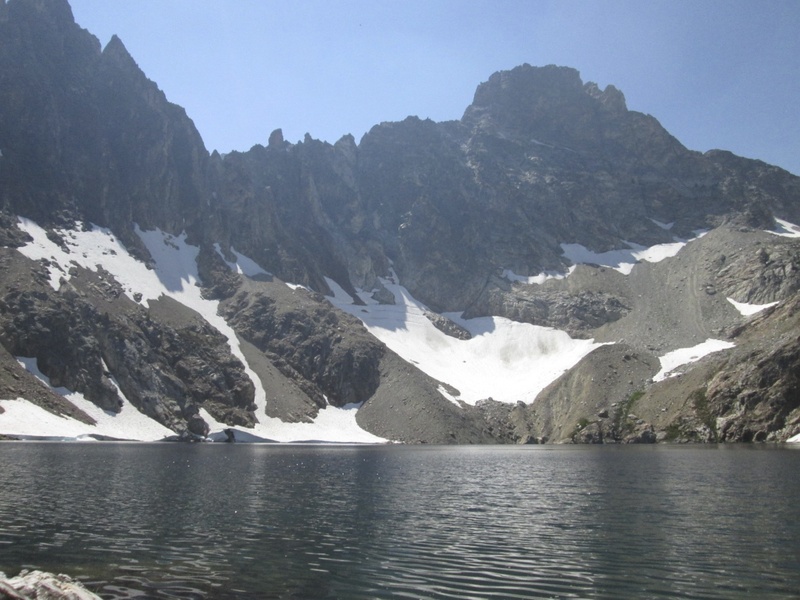 Some, such as Sawtooth Lake and The Baron Lakes, are well known locally while others, like my lake of choice, remain unnamed. My destination was noted on maps simply as lake 9,000, the elevation (in feet) at which it rests. Undaunted by that tidbit of information (aggressive hike for this old gal), and in spite of being very out of shape, I began planning my adventure. I even hoped to “bag” Thompson, the highest peak in the Sawtooth range, while I was at it… there is a route to the 10,751ft summit that isn’t technical, and which only requires hiking around the northwest flank and up the South Couloir (a steep, narrow gully on a mountainside) for a short scramble up rock debris, known as talus, to the top. A week prior to Totality, I managed to injure my back loading my fat old dog into our pick-up truck. The first few days, when I could barely get in and out of bed, I didn’t think I would be able to make the hike. By day five, of my seven day countdown, I had healed enough to carry on. But now another problem loomed… smoke. Earth’s warming climate has contributed to yet another summer of large blazes in the western US, and we were being inundated with smoke from both distant and regional infernos. Years back, on a summer job with the US Forest Service, I was sent out on a fire only to discover that I have an acute sensitivity to smoke. I was flown back to the Sawtooth National Recreation Area Ranger Station that I worked out of, in a tiny airplane with less cabin space than a VW Bug. We landed on the unpaved cow pasture airstrip known as the Stanley Airport… at the foot of the very same peaks from which I now intended to view Totality, 43 years later. I had spent the summer and early fall, of 1974, living in a tent in the forest… about a mile beyond the SNRA Ranger Station Headquarters. 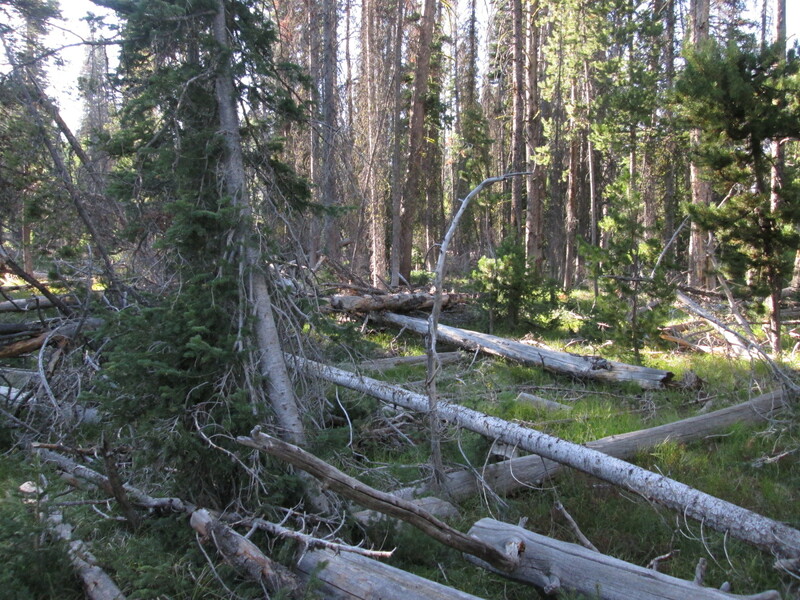 I was camped in a stand of lodgepole pines, just outside a protected watershed and next to a small meadow. Now, after all these years, I would be hiking to a source of that watershed… the cirque between Thompson Peak and Williams Peak. Completely coincidental and, very much, full circle. I started my hike at the SNRA Ranger Station, located in the upper right hand corner, next to the Highway 75 marker. My destination was the small round lake in the lower left hand corner… around seven miles from the SNRA Headquarters. My original plan had been to arrive in Stanley on Saturday, scope out the situation and alter my itinerary as necessary, depending on crowd conditions. Due to my back, however, I decided to move my departure to Sunday. At any rate, mainstream media had been hyping the event since late spring and reserve campsites had, long since, been booked up. With so many people flooding into an area prone to wildfire, I knew I would need a contingency plan in case something erupted before, during, or after the eclipse. 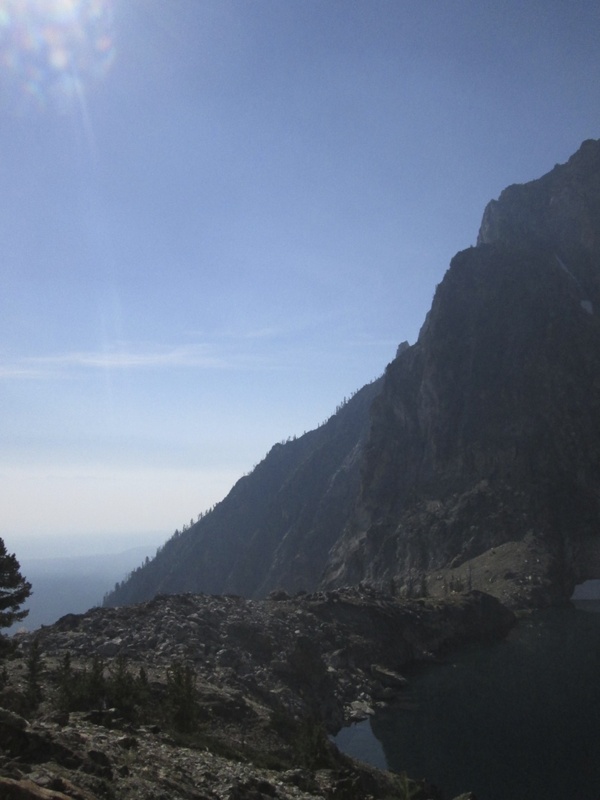 I had no wish to be caught in a blaze and decided to go to Stanley Lake, where there is ample dispersed camping and easy access, if the hike to Lake 9,000 had to be scrapped. 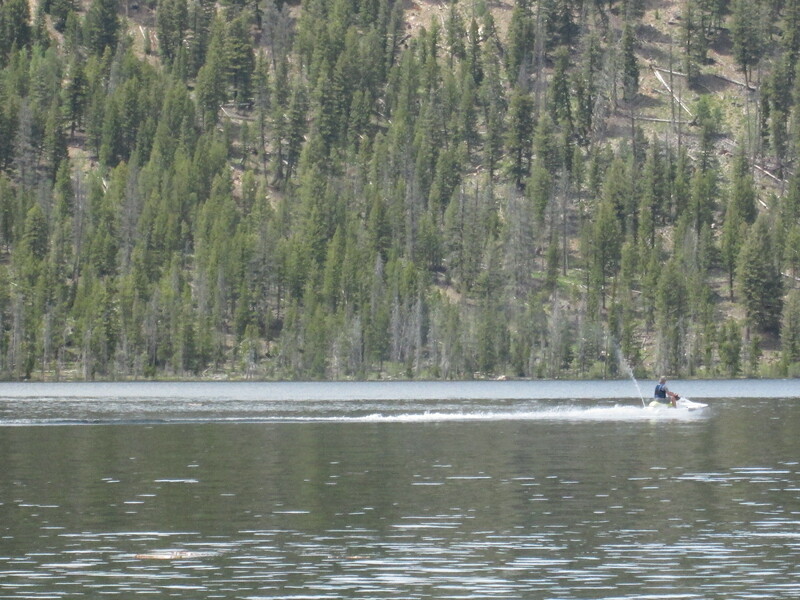 Stanley Lake can be driven to, being just a little above the valley floor, at 6,513ft elevation. 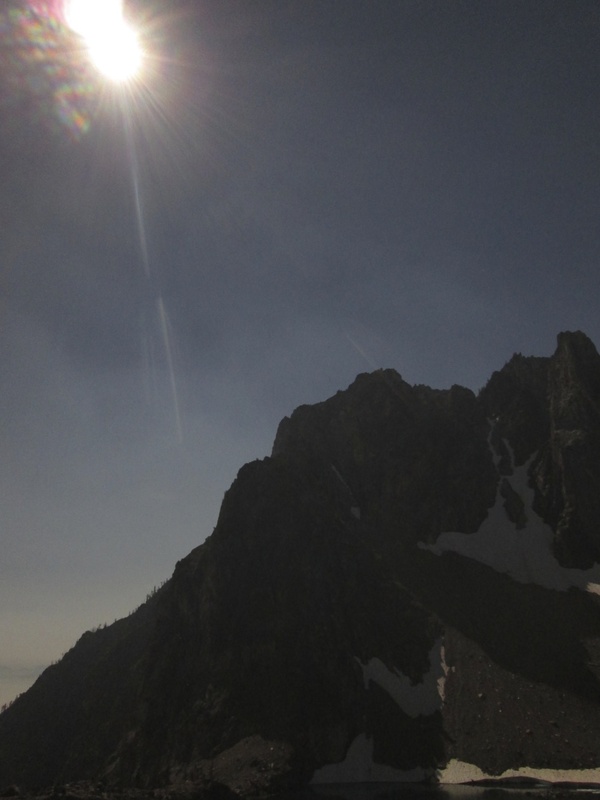 Unfortunately that lake’s dramatic backdrop, McGown Peak, would be out of frame during Totality… one reason I chose the more difficult route up to Lake 9,000. Another reason was Stanley Lake’s accessibility, which promised to make it an anthill of humanity during the event. Nonetheless, I kept it on my list of fallback locations. Ironically, the day of the eclipse a blaze did break out, and close to Stanley Lake… near Lady Face Falls and the Hanson Lakes, locations I had also been considering. By Saturday night, and with my back still an issue, I began to vacillate… nearly cashing the whole thing in when I put my loaded pack on and carried it around for a little while. Bearing in mind that I had not been on an arduous hike for at least a decade, I knew how out of shape I was. As I lay awake that night, determined to find a way to complete this sojourn, I decided to lighten my load in as many ways as possible. Changing to a smaller pack and, among other things, replacing my sleeping bag with a couple of good fleece throws, got the pack down to a do-able weight. That paring down included reducing my water from 4 liters to two… a decision that would return to haunt me, but I had read that the water in Lake 9000 was potable, so intended to refill my bottles there. Sunday arrived with a slight reprieve in smoke density so I decided to take my chances, hoping the smoke wouldn’t become an issue. 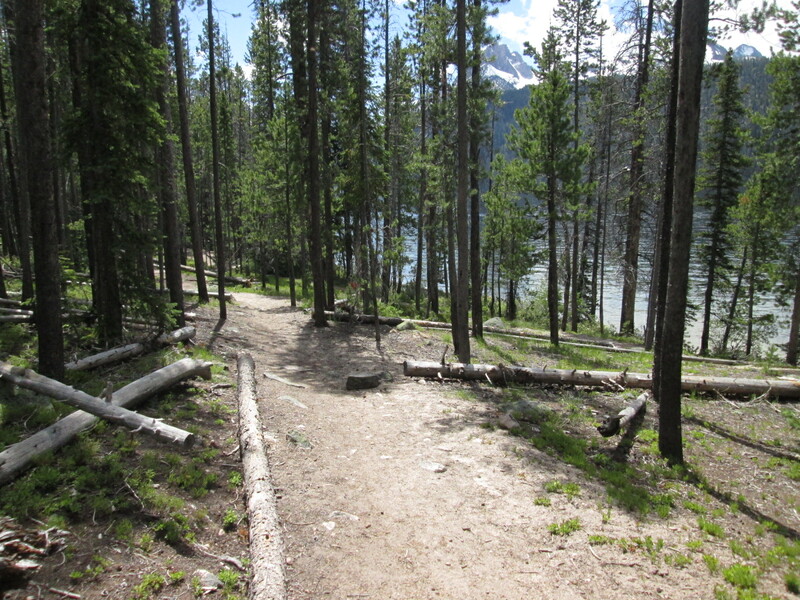 Nearing Redfish Lake, the closest trailhead to Thompson, I found that all camping and parking was full. Anticipating this, I had already planned an alternate route that would pick-up Alpine Way Trail via a shortcut on the north side of the glacial moraine that the trail traversed. Just half a mile from my old camp site back in 1974, I knew the terrain and was comfortable going off trail. I arrived at the road that would take me to my shortcut, only to find it blocked. The Forest Service had decided to close many of the access roads, prior to the eclipse, and my chosen route was one of them. This forced me to start from the SNRA Ranger Station… tacking a few extra miles onto my hike. It was now pushing 3pm and I was burning daylight. I left the ranger station, cut through the employee barracks, and was on my way. It was a gorgeous day, not too hot, and the smoke was still bearable. 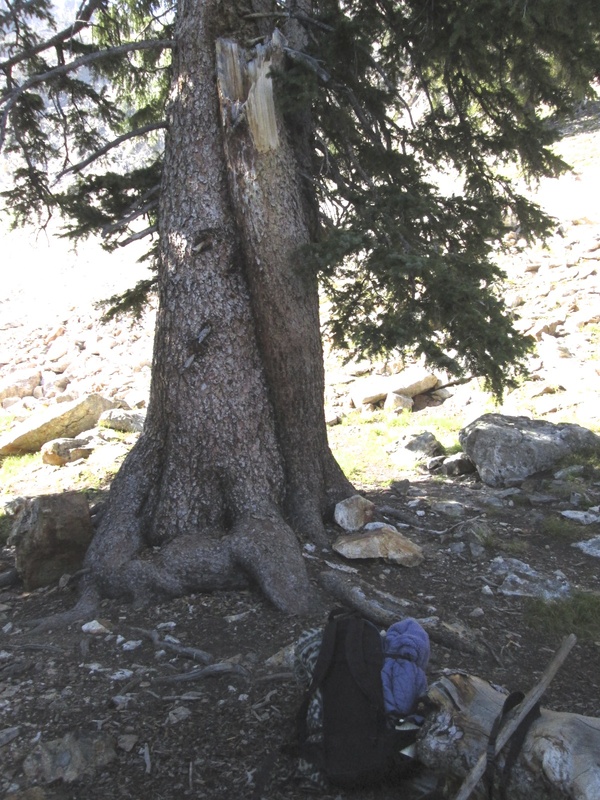 I looked for, and found, a nice lodgepole pine walking stick… one that would become my constant companion and invaluable support for this trek. 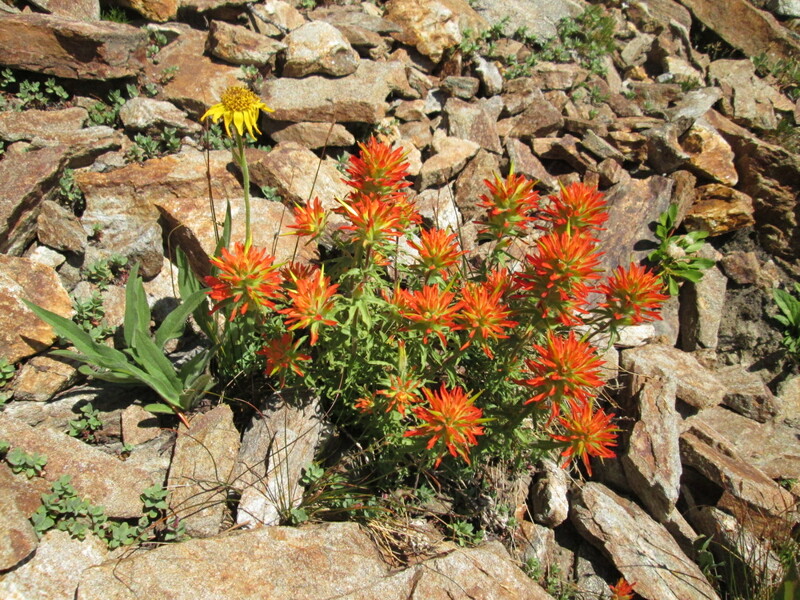 The summit of Thompson Peak, when approached from the trailhead at Redfish Lake, is a day hike totaling about 13 miles, in and back, with a 2,250ft elevation gain to Lake 9,000, which rests at its base. 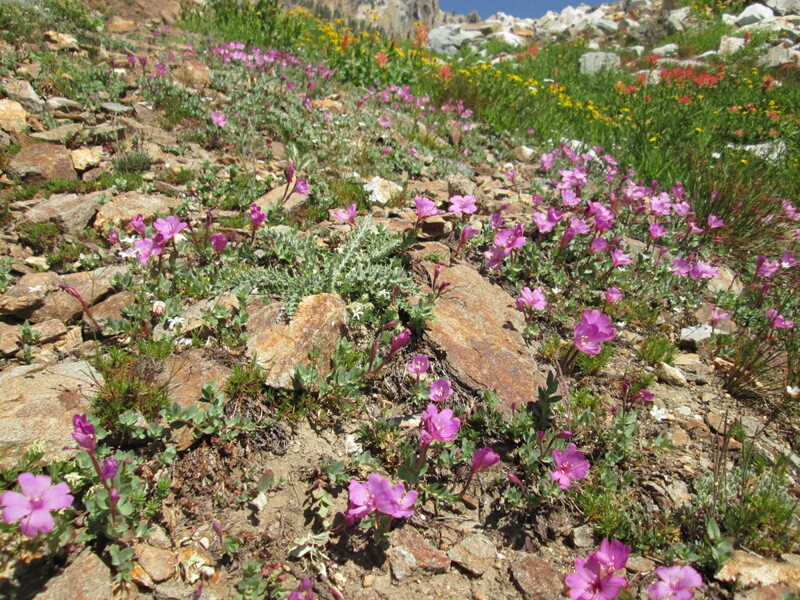 Most of the trail follows the ridge of a glacial moraine, gradually sloping up to the massive, quartz rich, Sawtooth peaks which jut vertically, like sharks’ teeth, from the bedrock. 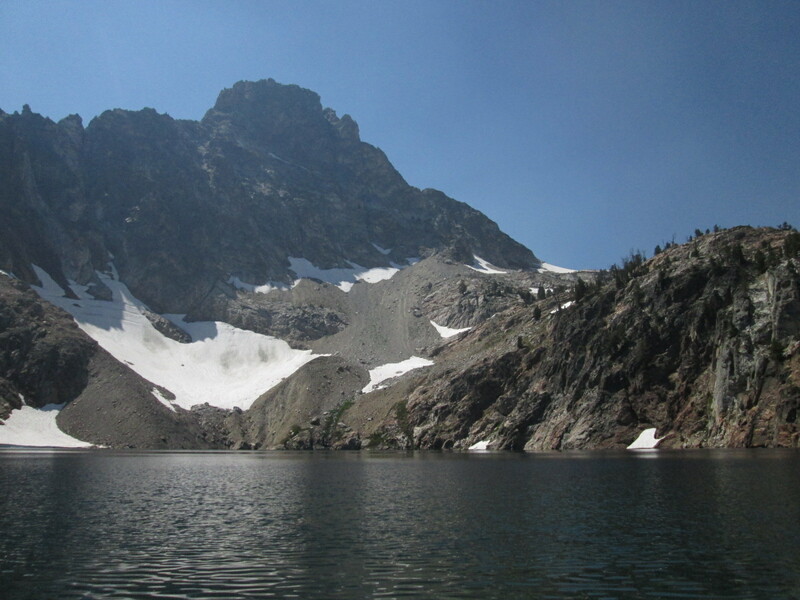 The last mile or so, to the lake, increases in steepness dramatically as it cuts across the flank of Williams Peak. 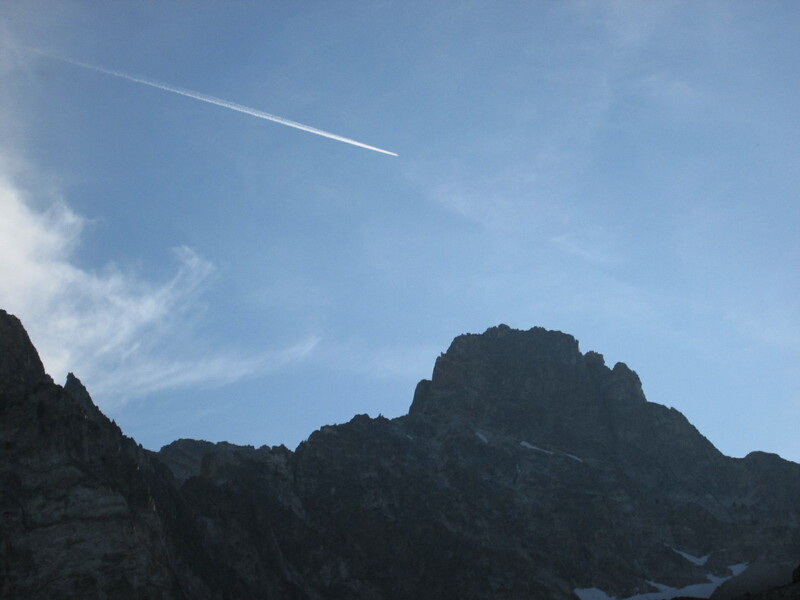 Thompson Peak, tallest in Idaho’s Sawtooth Range at 10,751 ft. elevation. After only a few hundred feet of trail, I discovered just exactly how out of shape I really was but stubbornly pressed on. When tired, I would stop and rest, which was embarrassingly often… good thing I was going solo. Each time I chose a downed tree to sit on, a quick glance around would reveal its deceased companions leaning precariously above and inspiring me to move along. 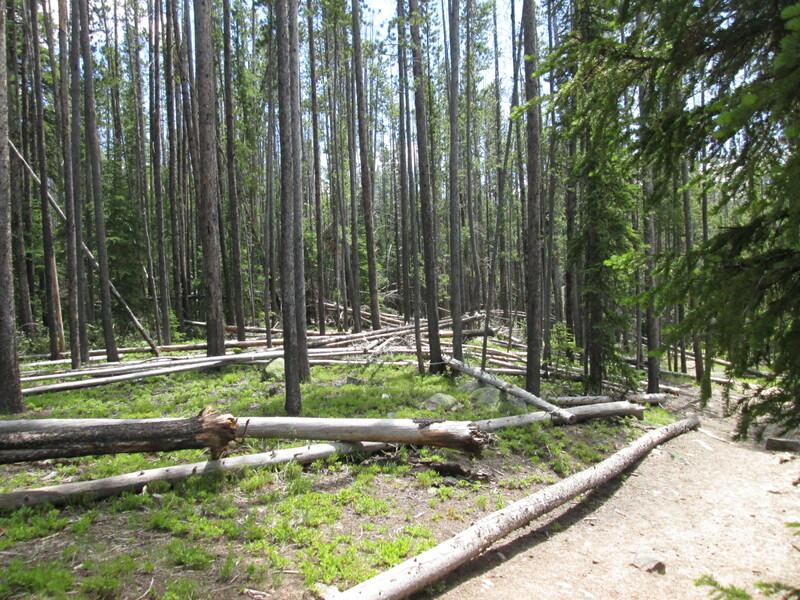 In fact, as I entered the forest on Alpine Way Trail I was stunned by its dismal condition. There is a high percentage of lodgepole pine here, a tree known for the scraggly appearance it can give to a forest it dominates. This forest, however, is well beyond “scraggly”… this is a forest in trauma. It barely resembles the ecosystem I lived in during the mid 1970s, in spite of the fact that it has been a protected Recreation Area since 1972. 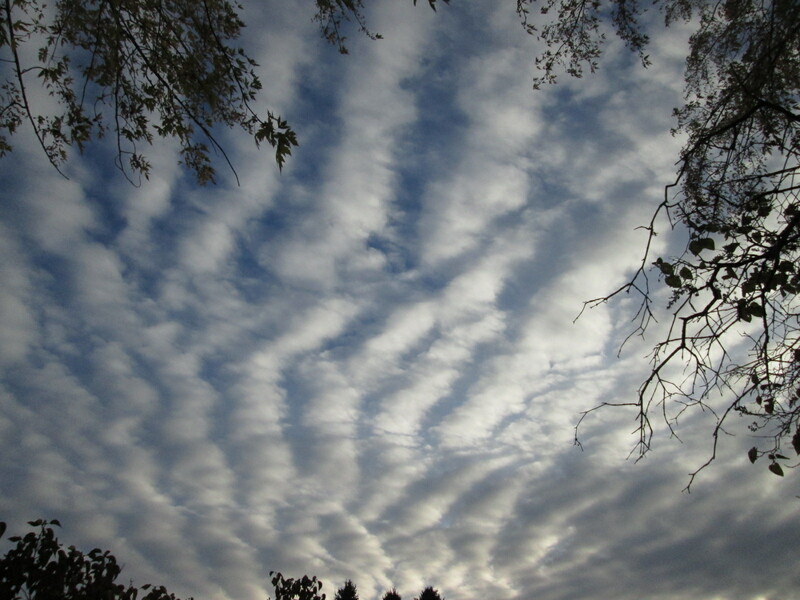 Like most forests around the planet it is suffering the impacts of a warming climate combined with the negative effects of geoengineering aerosols. Entering the Sawtooth Forest, Alpine Way Trail. There is no denying that natural climate change has been occurring. The problem is, the massive footprint of humanity’s ever burgeoning population is complexly, and overwhelmingly, impacting the course of that natural change… influencing and altering it in ways that are far from balanced or beneficial. 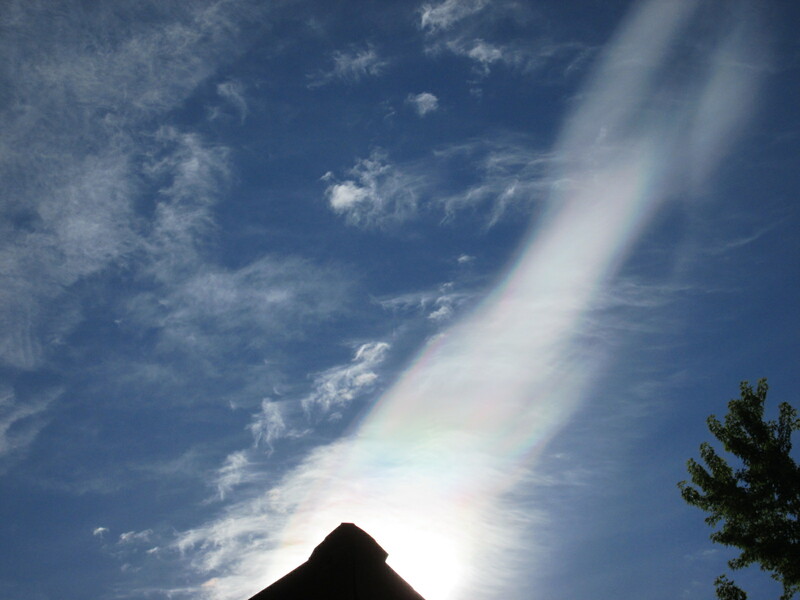 Especially in regards to climate geoengineering, a practice that is exacerbating an already dire environmental situation and pushing the biosphere over the edge. We are rapidly leaving climate change behind as we find ourselves hurtling, headlong, into abrupt climate shift. There were many examples of ecosystem distress that I wanted to photograph and document, along with breathtaking vistas, but I didn’t know how much memory or battery my camera would need for the eclipse. I decided to take pictures on the way out… like the reduction in water bottles this, too, would return to haunt me. Sawtooth National Forest, in trauma. 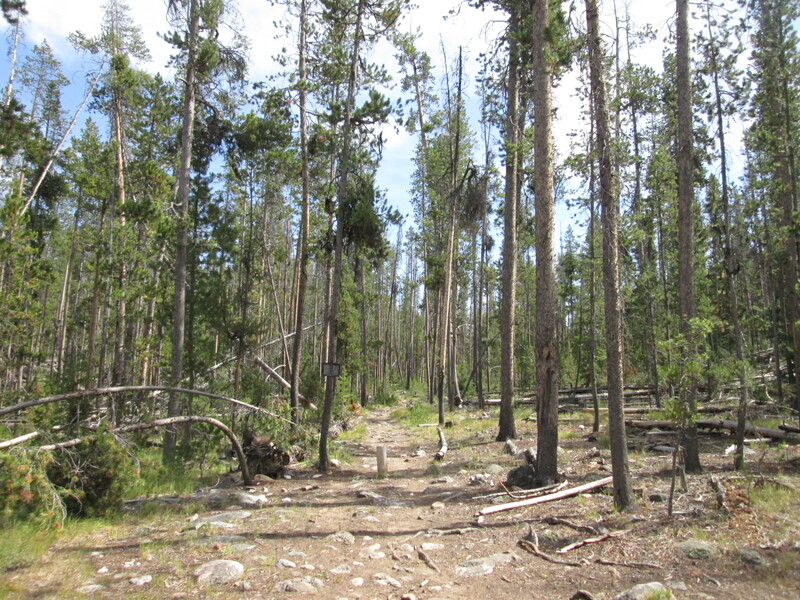 The hike up to the Wilderness Boundary was about 4 miles and uneventful. Pausing to rest often, I thought back to my earlier days here… these woods are a good deal more quiet now. No footfalls of native dwellers, no twigs snapping just out of sight. Less variety of bird calls. No constant buzz of flying insects. None of the general forest hubbub I remember from my youth. Such quiet, in a forest, is not a good thing. Too few insects, too many widow makers and standing dead… too much deadfall. There were ample squirrels and chipmunks, and the carpenter ant population was booming but, in an area known for its voracious blood suckers, there were surprisingly few mosquitoes and biting insects. Very few mason bees. We just came off an unusually heavy winter, with this area getting roughly 180% of average snowpack. I anticipated a lot of standing water with its accompanying bugs, but encountered none of that. The evaporation of the water from this winter’s snowpack must have happened suddenly, as there were many reports of high runoff, soggy crossings and standing water less than a month earlier. 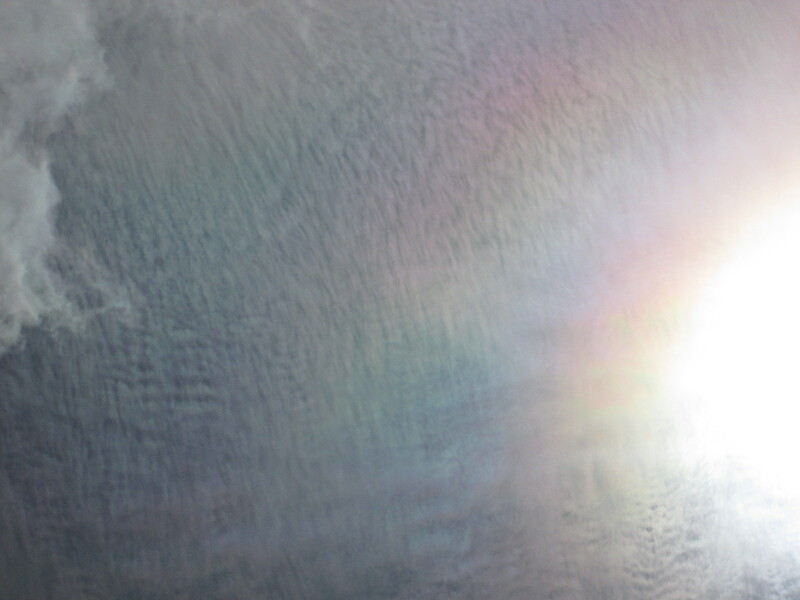 No doubt related to the excessively high UV levels occurring worldwide from Earth’s rapidly diminishing stratospheric ozone layer, this is yet another negative side effect of dispersed climate geoengineering aerosols which chemically interact with the stratospheric ozone layer and break it down, the same way sulfuric acid emissions from volcanic eruptions do (although a little skywatching reveals otherwise, the following links claim Solar Radiation Management, or SRM, aerosol dispersal programs are not yet in effect… nonetheless, the data they present regarding effects and side effects is still prescient, and the side effects mentioned in the following link, from Stanford, are already profoundly present: http://large.stanford.edu/courses/2015/ph240/llanos2/ …this link addresses the catastrophic extinction potential of aerosol geoengineering, relating it to a past extinction event: https://phys.org/news/2017-05-volcanic-geoengineering-climate-catastrophe-animal.html and pay particular attention to the health effects listed in this link, in regards to your own health and the health of those around you: https://www.ncbi.nlm.nih.gov/pmc/articles/PMC4717532/). The lack of biting insects was pleasant, but a troubling harbinger of what our future holds. I had forgotten the importance of long, solitary walks in nature. Not only are they just plain good for the soul, they’re an important opportunity to monitor the changing condition of the world around us. Simple, yet profound, long walks offer much to observe and consider… and the time for considering. 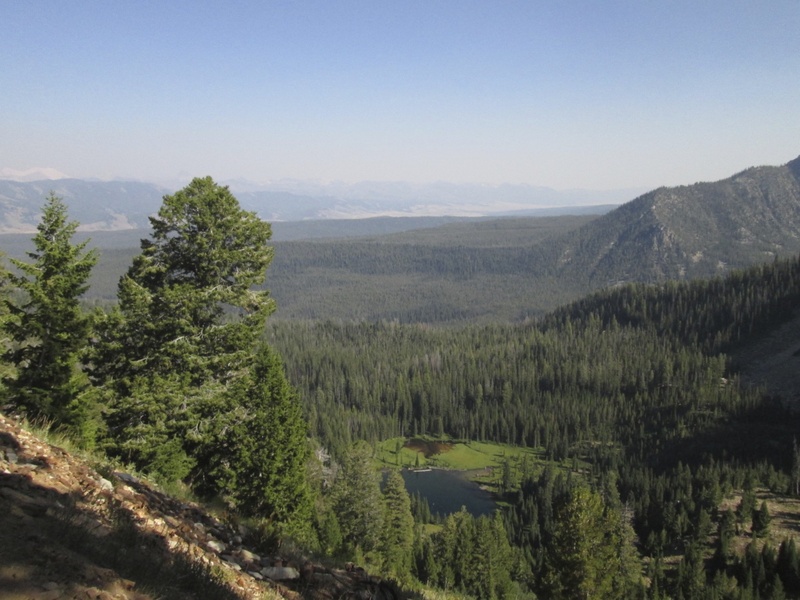 Wilderness Boundary, Sawtooth National Recreation Area, Idaho, USA. Other than a mom and her teenage son, on their way down from a day hike, traffic was non-existent for the first few miles. Nearing the Wilderness Boundary, on the highly developed Redfish Lake side of the moraine, foot traffic began to pick up… though mostly more day hikers returning to Redfish. 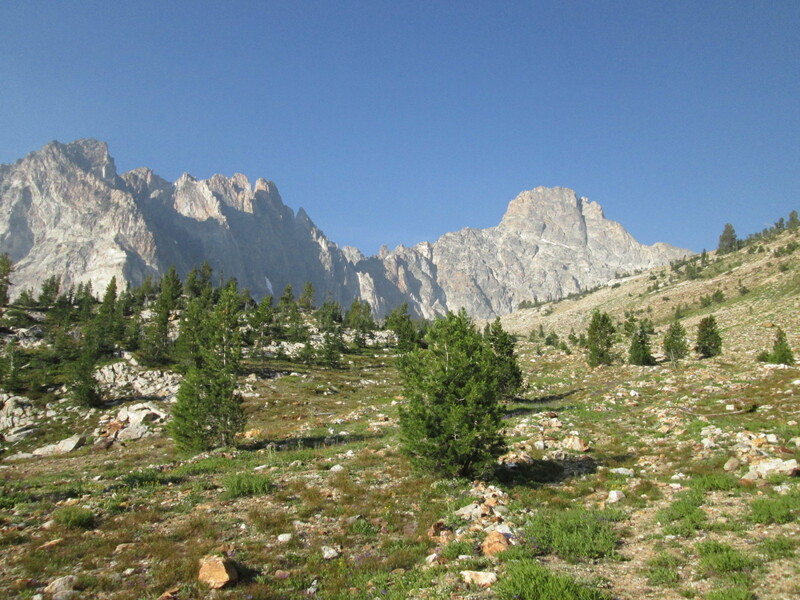 I had, by this time, emerged from the lodgepole pines and onto the south facing slope of the moraine… a zone dominated by sagebrush and aspens, with pines and firs defining the periphery of the forest that blankets the north facing slope but is absent on the south. 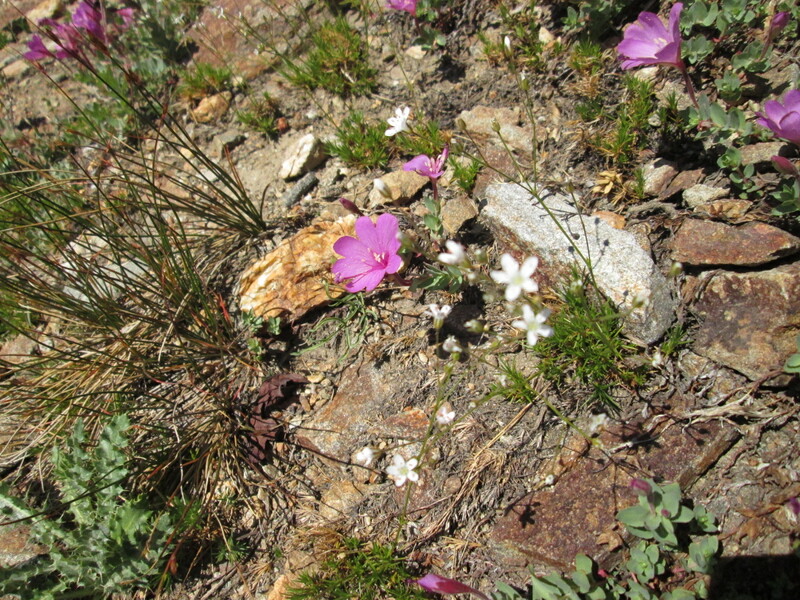 The gentle incline of the trail divides these two micro-climates, as it continues along the ridge of the moraine. The unmarked fork in the trail that I was looking for, which would take me to Thompson Peak, was still a couple of miles ahead. 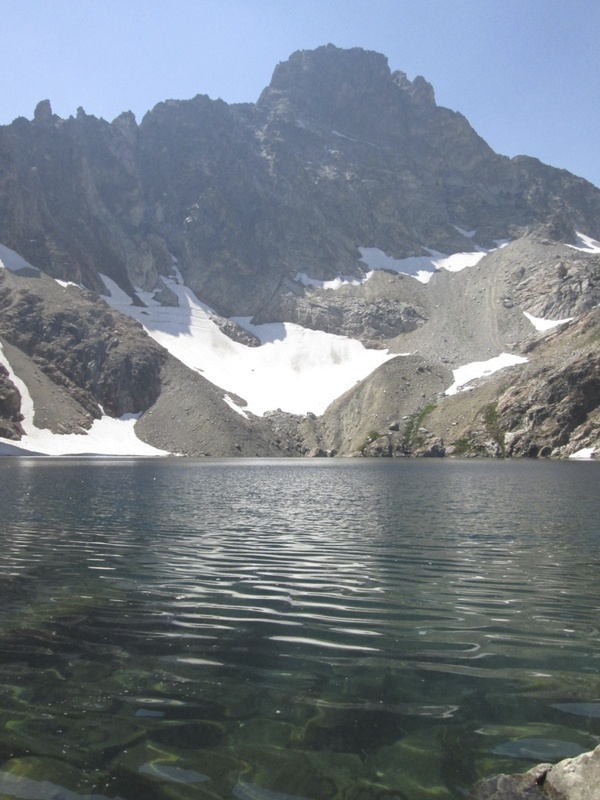 The official destination for this portion of the Alpine Way Trail is Marshall Lake but the picturesque unnamed lake, between Thompson and Williams peaks, is so popular that the path to it is easy to spot, even though not marked. This was a little cooler section of the hike, with ample shade and resting places. Impressive vistas of rocky spires, for which the Sawtooth Range is known, had been my constant companions since I broke out of the lodgepoles and onto the sage covered southern face of the moraine. 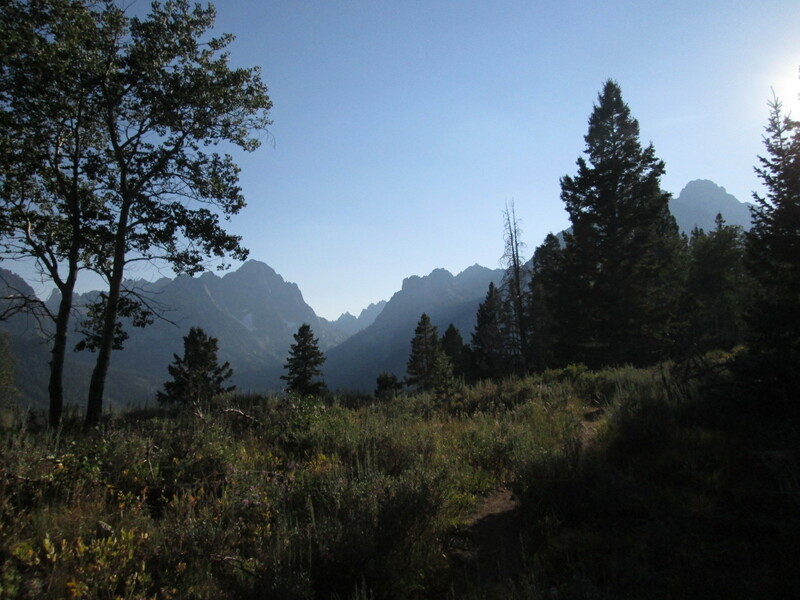 Now, as I traveled along the upper bench of the moraine, the peaks popped in and out of view with the path leading me through alternating segments of forest and open sage. In spite of my growing fatigue, this was memorably pleasant, reminding me of a magical zone where Aragorn or Frodo might materialize at any moment. Sure, I was aware of those blisters building on the soles of my feet, but I was around 3/4 of the way to Lake 9,000… I could handle it. Besides, I had a roll of medical tape and would deal with them later. As the slope gradually increased its pitch, the memorably pleasant section of trail became less memorable for its comfortable incline and cool shady patches, and more for its duration. 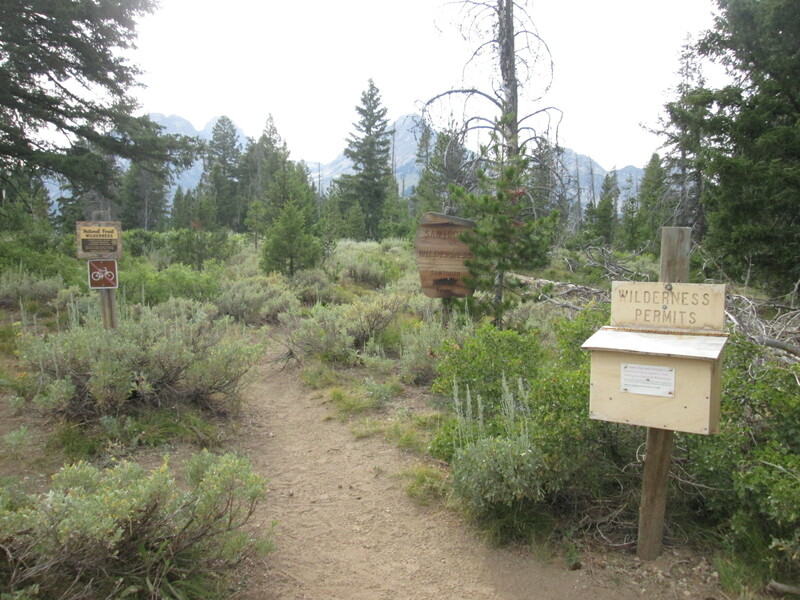 Didn’t the note, scrawled on the wilderness permit box a few miles back, say Marshall Lake was 2.5 miles? Where was that fork in the trail, anyway? Did I miss it? By now it was late in the day and the sun was approaching the horizon, its descent abbreviated by the looming peaks to the west. My internal timer was beginning to go off but, since I forgot to bring a watch and don’t own a cellphone, I had no idea what time it was. I still had good daylight though. 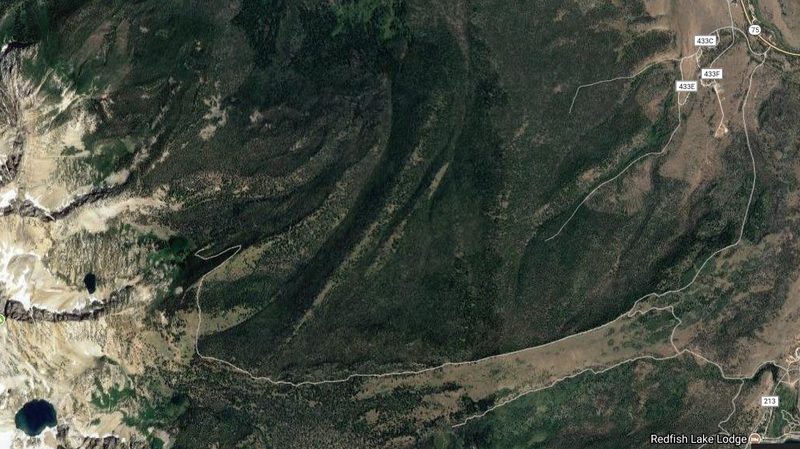 Counting on my memory of the satellite images I had studied, I pressed on. Finally, I arrived at the fork in the trail. This leg of the hike began with a shady, gentle slope… for which I was grateful. Unfortunately, that was very short lived. 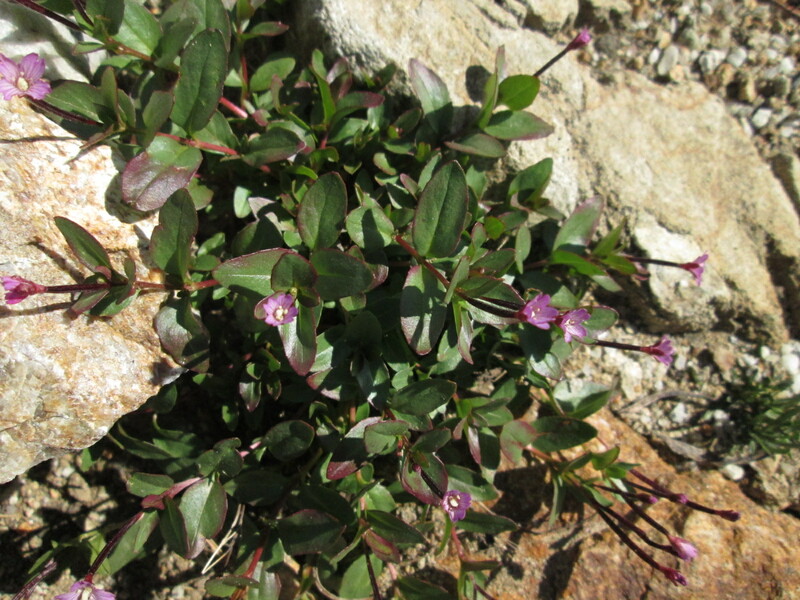 Almost immediately the path broke out onto the steep, sage and rock covered, southeastern flank of Williams Peak. At this point, although still fairly obvious, the trail became more difficult to keep track of, often becoming multiple choice. The 8,000 ft. altitude, and steep incline, made me pause and rest frequently. Yet, even at my snail’s pace, I didn’t encounter any other hikers through here. I assumed those coming out, already had, and those planing to stay, were at their campsites… this would turn out to not be the case. Warning… poor quality videos ahead! 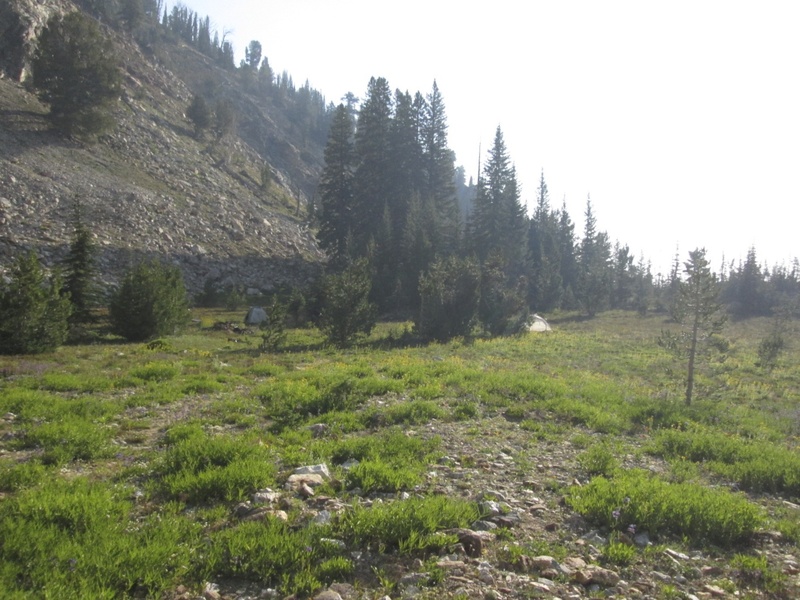 My goal, that day, was a hanging meadow just below Lake 9,000. A shady oasis of green with a tiny pond, held in place by a headwall and massive rock debris pile, it perches above a steep talus slope of boulder fragments from imposing Williams Peak, whose south-eastern flank the trail traverses. From the hanging meadow it would be only another 1/2 mile climb over scattered scree and talus, to a viewing point above the lake. I had enough daylight to make the meadow, maybe even the lake, but I didn’t have enough stamina. In my haste to make it up the mountain, at a reasonable hour, I had stopped to eat only once… a fried bean and cheese burrito from a grocery deli. Now, neglecting to fuel up was beginning to take its toll. 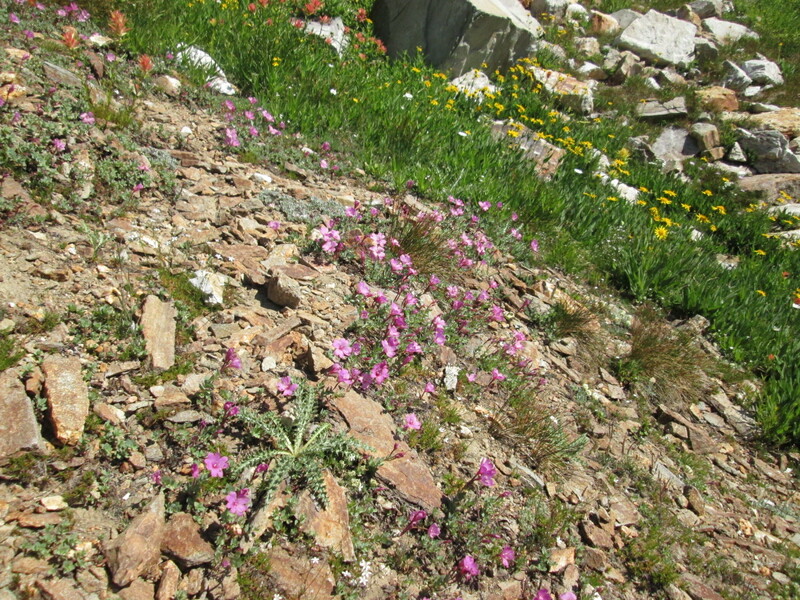 In spite of still having ample daylight for more hiking, I began scanning the steep, rocky slope for a place to sleep. The last thing I wanted was to push myself too hard and fall down the mountainside because I tripped or passed out. As it turned out, this was a good decision… the more difficult to traverse talus (slope of large broken boulders, scree is similar but smaller) was only a few hundred feet from where I stopped, although I wouldn’t discover this until morning. By this time I was completely exhausted. I found a flat spot up above the trail, with just enough space for my ground pad. There wasn’t room for my pack, so I placed it at the head of my ground pad and tied it to some brush to keep it from sliding down the mountainside during the night. This served as a pillow and extended the length of my bed. Immediately up slope from me was the south face of a small rock outcropping, which retained a good deal of the day’s heat throughout the night. Down slope was a gnarly sagebrush that acted as something to anchor against. I knew sleeping in the brush carried a risk of deer ticks, but my location was so dry and steep, with a lush grassy meadow and pond beckoning far below, my guess was the ticks and other predators were down in the meadow waiting for deer. Dusk arrived about the time I got settled in, so I prepared for a long night. A little before dark I heard a noise and looked down at the trail to see a lone hiker. He must have heard me, too, as he glanced my way. I waved and hollered “hi there!” which seemed to startle him. We exchanged trail talk and, as he had not hiked this way before, I told him as much as I could about the path ahead… letting him know that my info was just data from a computer screen. He carried on toward the hanging meadow. Well after darkness fell, I heard more sounds approaching… this time accompanied by lights. I was truly stunned to see folks hiking this trail in the dark, but it would not be the last time I would see passersby that night. Eventually the lights appeared on the trail below and were soon scanning my position. Again I waved, shouted a greeting and offered my assessment of the trail ahead. This time the hikers were a couple of young gals. They, too, were exhausted and decided to camp instead of continuing on in the dark. They chose a spot, about 40 feet past mine, and settled in. Another set of lights and hikers came along a while after that. After the usual exchange, they decided to brave the talus slope and disappeared into the night. It had been decades since I slept in the wilderness of the SNRA and I relished the chance to lie, once again, under the glorious blanket of glittering lights that a night in the Sawtooths can offer. Those brilliant starry canopies have largely vanished from lower elevations, the result of light pollution and global dimming from ever increasing levels of aerosolized particulates in our atmosphere. Even in the tiny mountain town where I live, at 5,200ft. elevation, the Milky Way has become a vague ghost… sometimes not even discernible on a clear night. 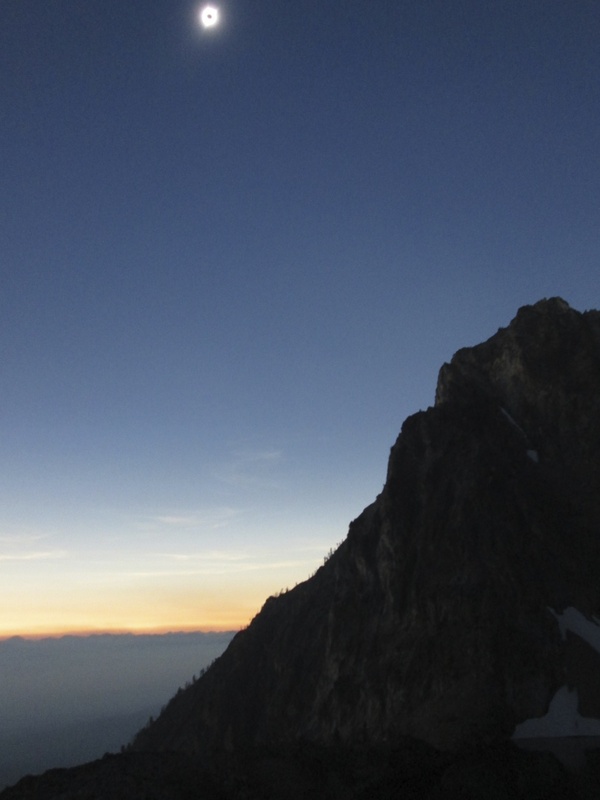 Lying in the darkness, 8,700ft up, on the flank of Williams Peak, I was bathed in the vastness of the sky above. Drinking in the Milky Way and the host of sparkling gems surrounding it, watching late season remnants of the Perseid Meteor Shower… I could not help but wonder at how simultaneously finite and infinite our reality is. Alone on a mountainside in the wilderness, like a tiny grain of sand in the dark of night… to unexpectedly be joined by fellow travelers, in search of the same celestial reward as myself, was truly astounding. How cool and bizarre is that? 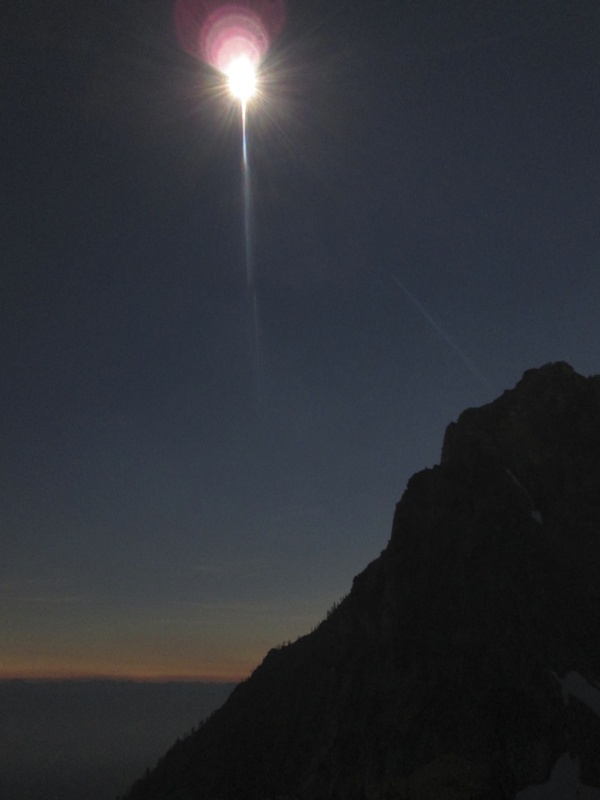 The further I traveled up this mountain, on my quest to Totality, the more Tolkienesque it became. 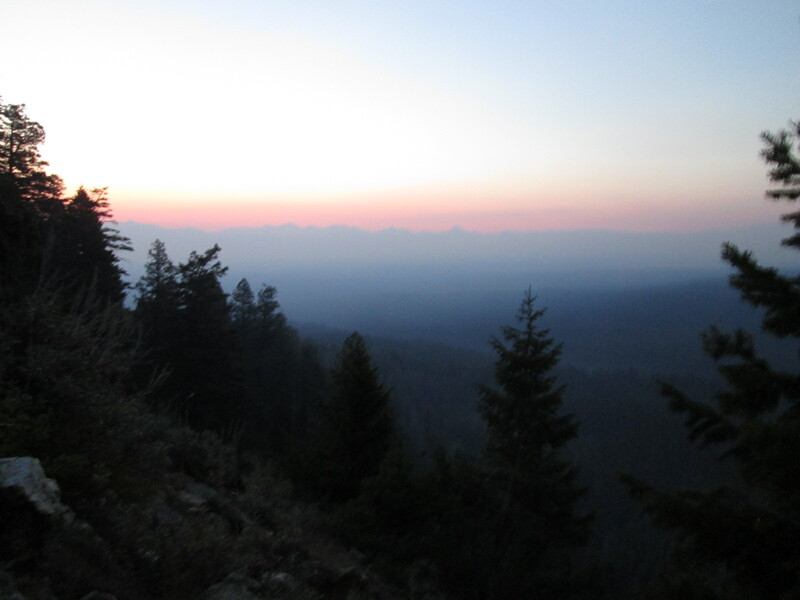 A smoke filled Dawn breaks over the White Cloud Mountains (aka The Whiteclouds) and the Sawtooth Valley. Monday morning daybreak brought catastrophe. 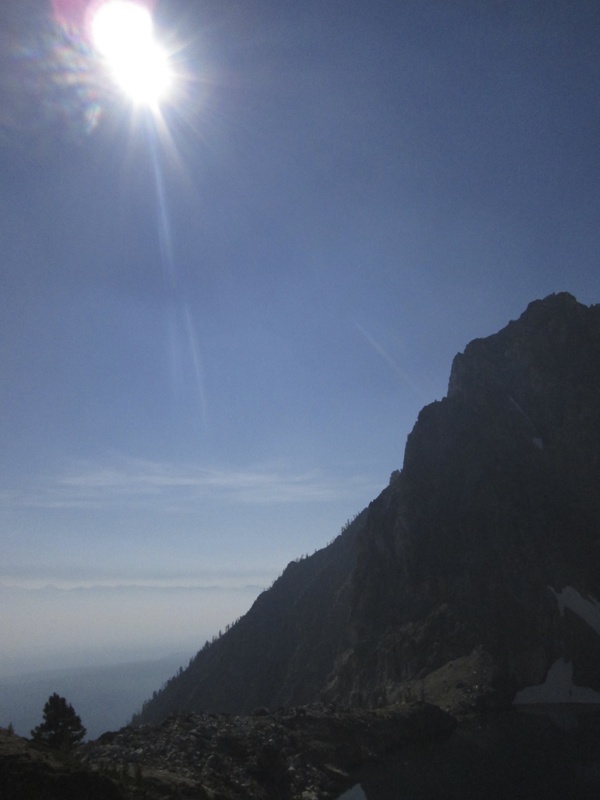 As I waited out the night, regaining my strength and re-oxygenating my blood, a slithering dragon had crept silently in… filling the Sawtooth Valley with fresh thick smoke, from yet another regional forest fire. Looking out in disbelief, over the scene below, my heart sank. 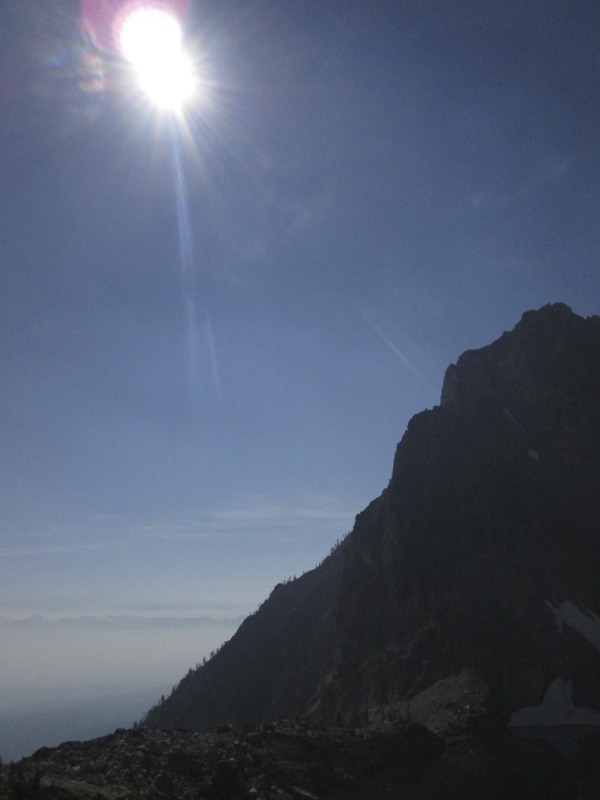 I had hoped for a photographic composition that would include the eclipse, Lake 9,000, a Sawtooth ridge, the Sawtooth Valley and the mountain ranges beyond… but atmospheric conditions now threatened to steal all of that away. I knew the smoke, in the distance below, would rise with the day’s temperature. It was now a race between the smoke and visibility to the distant horizon, an important element of my hoped for composition. I also realized, while reorganizing my pack, that I had only brought 1.5 liters of water… which I had finished during the night, thinking I still had a 1/2 liter left. Now I would be dry until I arrived at the lake. The juice I had just finished, along with a light breakfast of apple sauce, yogurt, and a handful of fruit and nut mix, would have to do. Since I hadn’t brought a sleeping bag, it wasn’t necessary to remove my shoes to sleep, so I decided to leave my blisters alone until I got to the lake where I could clean and dress them. 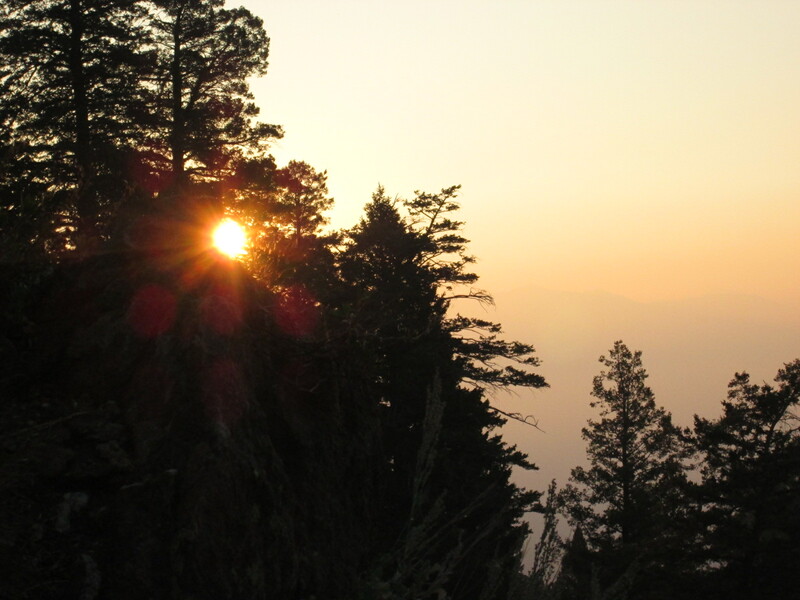 Sunrise… the White Cloud Mountains, less than 10 miles distant, are ghost-like on the horizon. I had decided not to eat, the previous night, so the aroma of my food wouldn’t attract bears. Once headed up the trail I discovered that this decision was affecting my energy. That, in conjunction with nausea from the ever increasing smoke, gave me serious pause about the safety of continuing. But I was really very close now and, with so many hikers in the vicinity, far from being alone if something unexpected happened. A steady stream of folks had been making their way up that mountain and most seemed to be kind and caring individuals. Happy to be there, happy to see others there, happy to share the experience. There is much can said about those who find pleasure hiking in the mountains… it requires a certain mindset to work so hard for such a simple, sometimes profound, reward. I may not qualify as one of that rarefied crowd, but I do enjoy the fruits of a mountain hike, especially this one. Stubbornly, I pressed on. 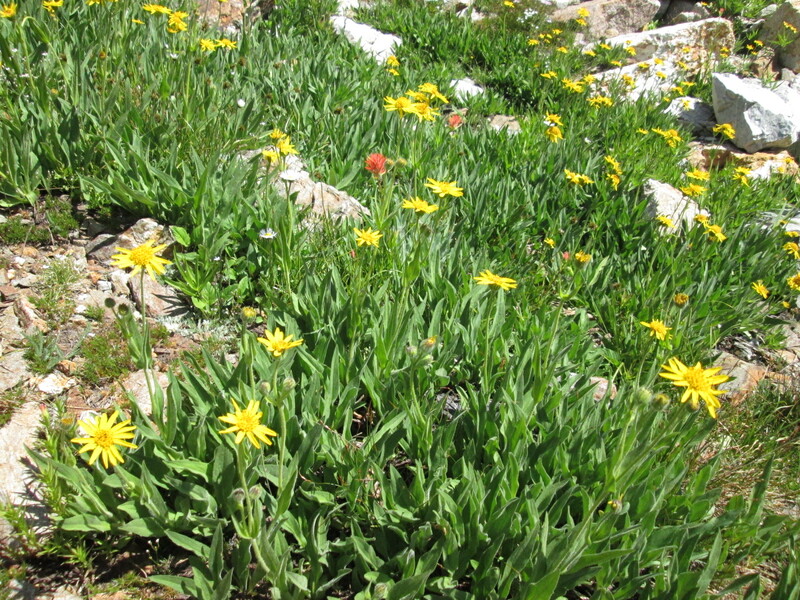 I had scarcely found my walkin’ legs when the steep talus slope, guarding The Hanging Meadow, loomed before me. On one side, stood I. On the other, a tiny creek could be heard but not seen, cascading through broken boulders, on its way to an emerald meadow below, where a pair of deer peacefully grazed. Traces of the trail could be spotted alongside the invisible creek, leading up to massive, ancient, Ent-like Whitebark Pines, standing sentinel at the entrance to The Hanging Meadow. And between? A scramble over sharp edged boulders of every size and shape, where the multiple choice trail vanished and reemerged at its own discretion. 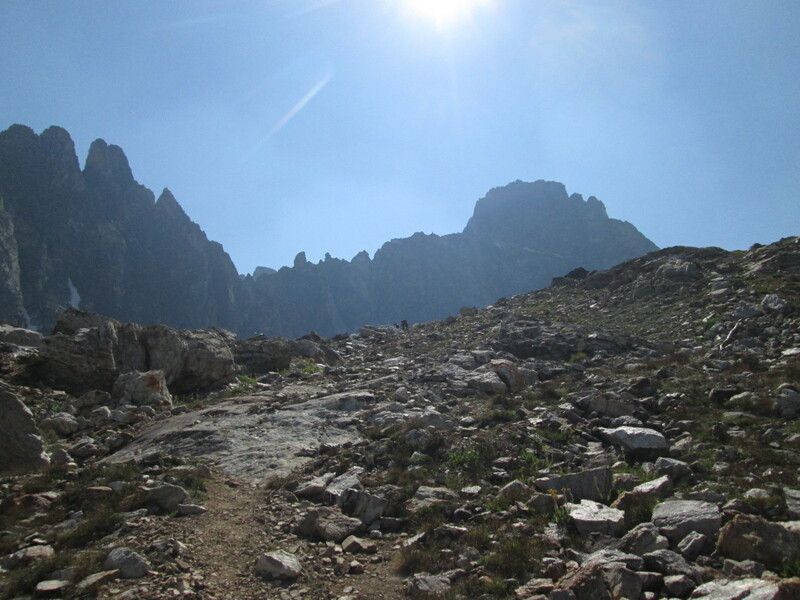 Soon, and without incident (other than leaving a 3″ long chunk of my walking stick wedged between some boulders), I was across the talus and headed up the trail. Deer graze peacefully alongside a nip-and-tuck creek, in the meadow far below where I spent the night. 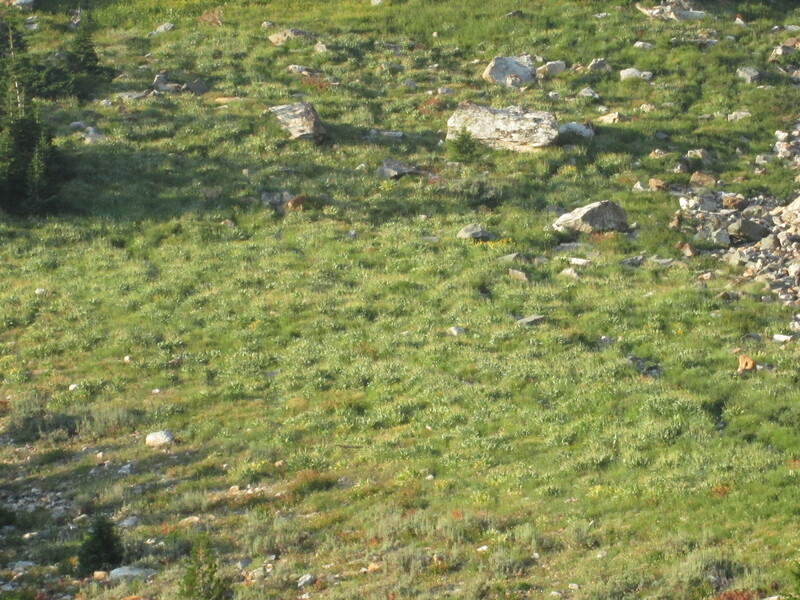 The Hanging Meadow, graced by ancient Whitebark Pines, like a guard of Ents, beckons from above. Arrival at The Hanging Meadow, flanked by looming peaks and ridges, was like walking into yet another Tolkien scene… perhaps similar to approaching Rivendell. Cool, green and shady; a respite for the weary. At this altitude the UVs are especially strong so the heat from the Sun quickly becomes oppressive. 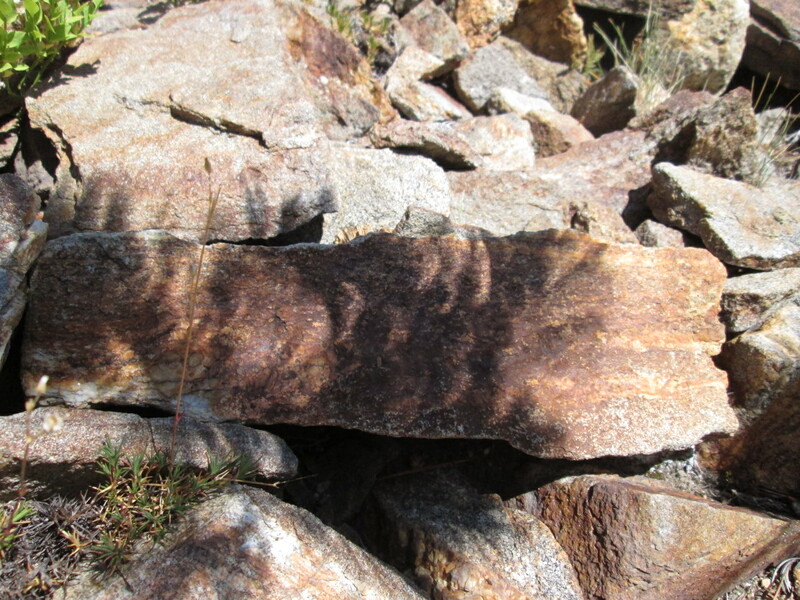 Shade, here, is a much cherished commodity as even a short time hiking in the intense direct sunlight can be taxing. The small pond, visible in satellite imagery, did not survive the summer and had evaporated down to a tiny puddle. 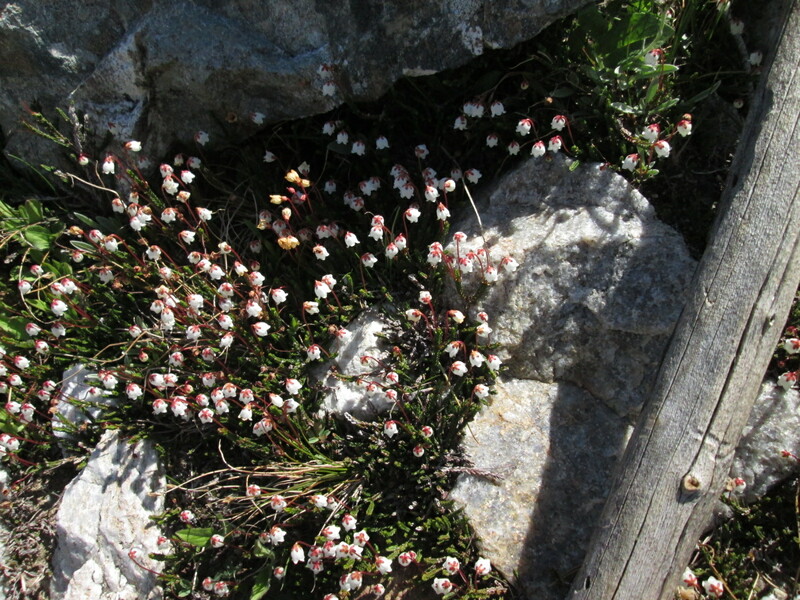 Underground, however, its heart was still beating… revealed by the tiny cascade that obstinately made its way down, along the edge of the talus slope, to the verdant meadow below. With my goal so close at hand, and the clock ticking down to Totality, I paused only long enough to regain my strength for the final leg of the hike in. I had long since decided I could not summit Thompson, so my destination was now tantalizingly close. 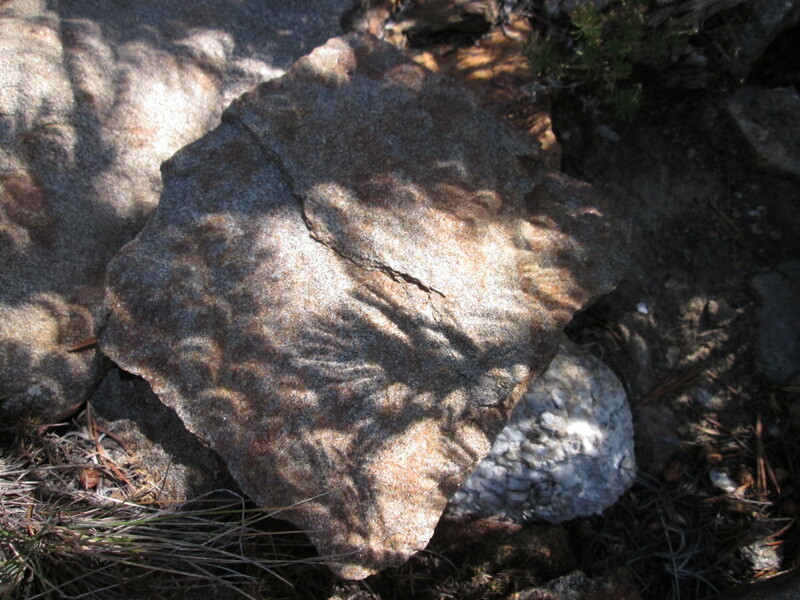 It was around 9:00am, and Totality would not occur until 11:30am, Mountain Time. I was going to make it! Leaving The Hanging Meadow behind. 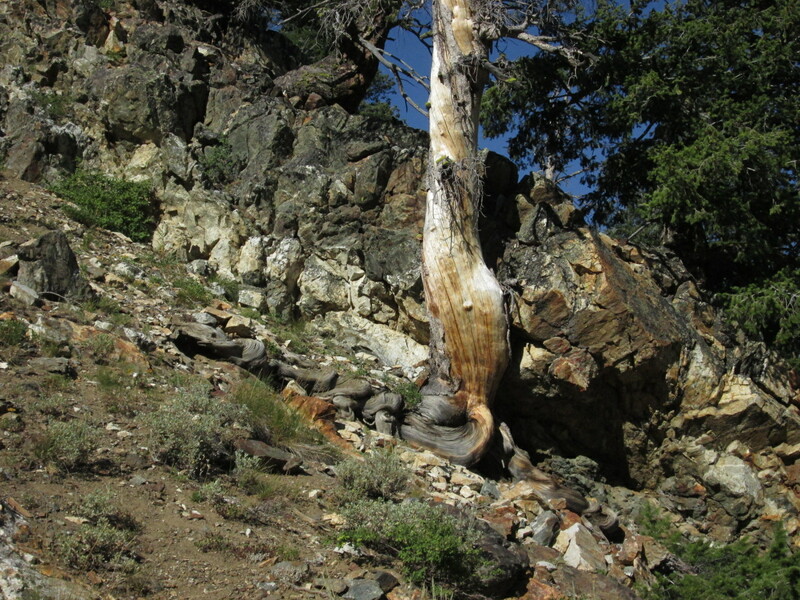 Over 1,000 years old, the scale of the Whitebark Pines, that guard its entrance, is easier to see from this vantage. 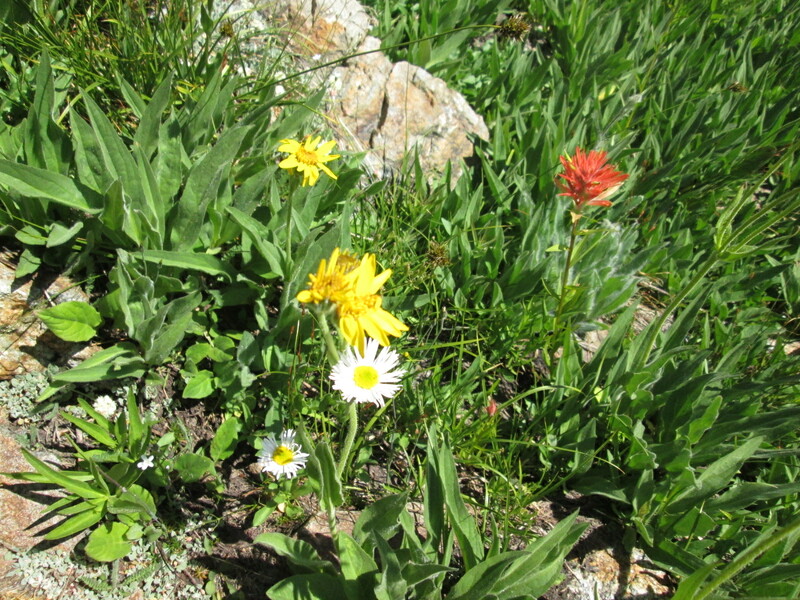 Turning from The Hanging Meadow to address the final leg of my hike in… to Lake 9,000 at the base of Thompson Peak. Although this leg of the hike was harder than it looked, it was easier than what I had just come through. 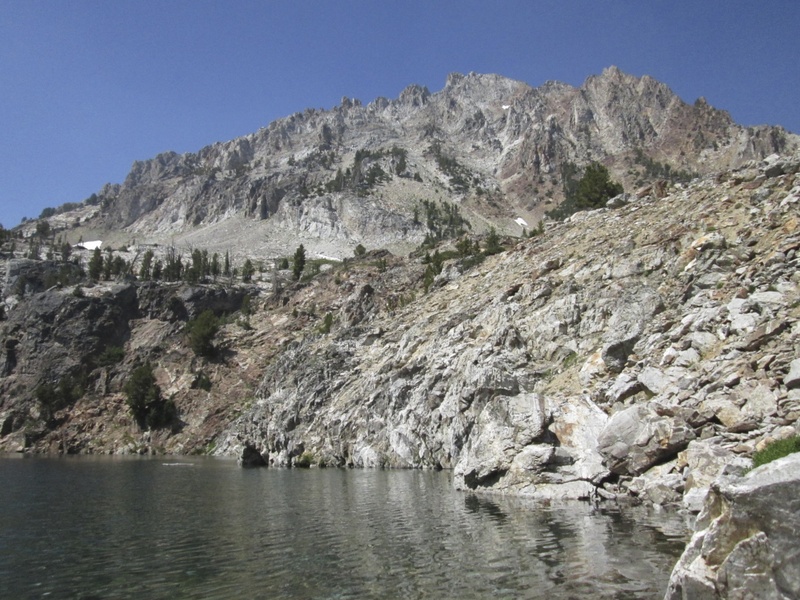 With the help of my trusty walking stick, my blisters and I slowly picked our way through the scattered scree and talus, and up to the top of the rock debris wall that constrains Lake 9,000. What a bittersweet reward… so close and yet so far away. A refreshing oasis, held in the snowy embrace of two magnificent mountain peaks. It looked close enough to touch. Unfortunately the way down to water’s edge, through large broken blocks and rubble, is slow and tedious… for this old gal and her sore feet, anyway. I would have to wait until after Totality to replenish my water supply. Instead, I found a flat, shady place to unroll my ground pad, sat my pack down next to it and reclined for a few moments rest. Within minutes the Moon began to edge over the Sun. Resting just a bit longer, I soon caved in to anticipation and was off to find a vantage point. I settled on a rock outcropping, near a cliff overlooking the lake, but could have probably found a better overall composition had I arrived the afternoon before. Once I got the best angle I could manage, I sat back and enjoyed the experience unfolding around me. Snippets of distant and nearby conversations, laughter, tripod mounted cameras with lenses as long as your arm, curious birds and golden-mantled squirrels, wandering dogs, tiny colorful tents popping out of solid rock or tucked behind shrubs and gnarled trees. 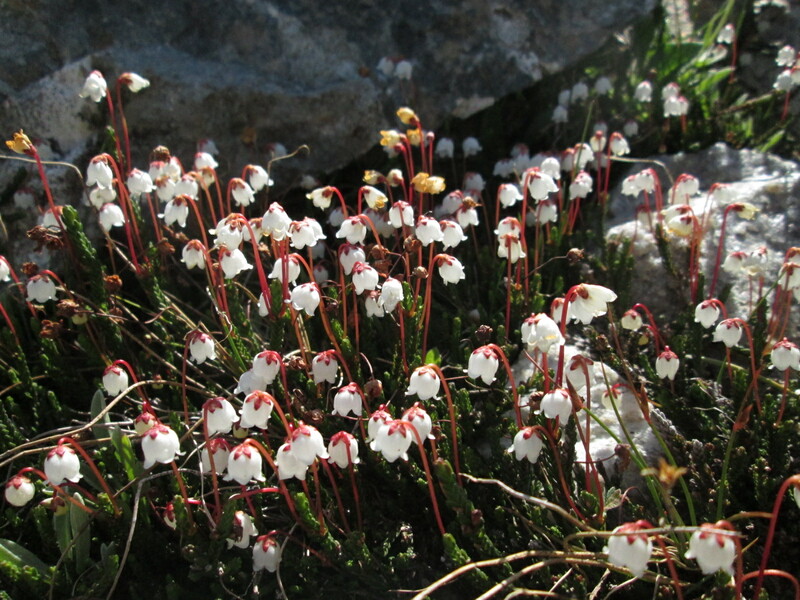 A tiny carnival, crammed between craggy mountain peaks, dotted with carpets of miniature wildflowers and ancient, Bonsai like conifers, all centered by an indescribably beautiful, glittering, snowfield edged, jewel of a lake… it was surreal. It was incredible. And “it” had not yet begun. Lake 9,000’s crystal blue water, beckoning below. 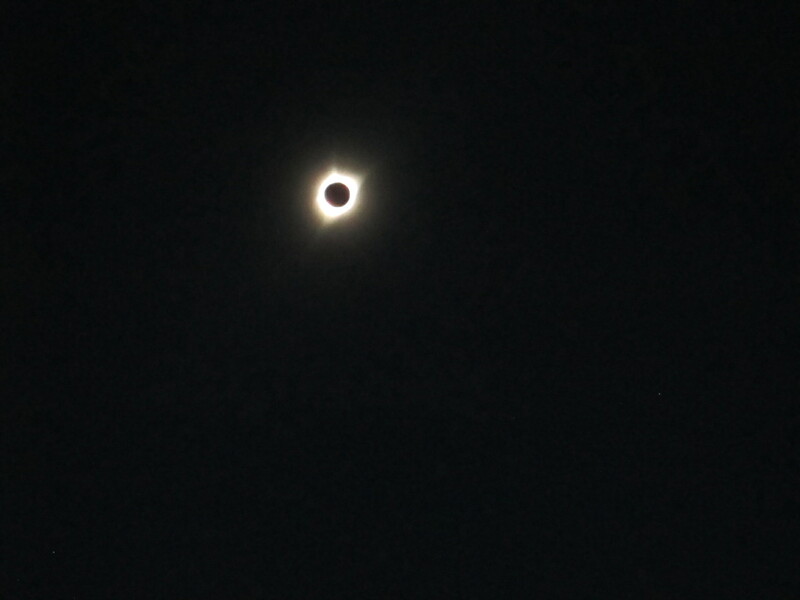 The biggest regret I have about not taking video, during Totality, isn’t so much about missing the visual… I’m not even sure the video function, on my $90 Canon, could have even captured the effect. The thing I regret most is missing the audio that accompanied this event, as it was being witnessed by the small gathering of intrepid travelers. 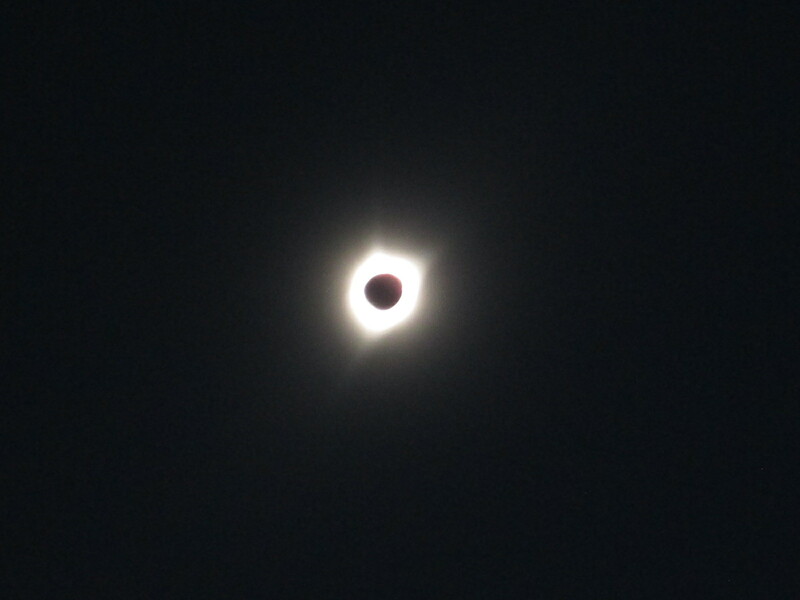 First came the excited hubbub on the verge of Totality. Then the ooohs and ahhs, which gradually increased and carried on for some time into Totality. There was excitement as Venus and other celestial bodies appeared, surprise at the rapidly dropping temperature, and a constant babble of comments which gradually evolved into silent awe as everyone fell into their own reverie, inspired by the moment. Suddenly, the diamond ring appeared and the entire mountain erupted in a cacophony of hoots and hollers… even applause. Those of us who stayed near the lake for viewing were showered from above by shouts of exhilaration from the 35 committed souls who had made it to the top of Thompson. Here we all were, this small group strangers, high on a mountain, alone together, sharing a singular moment of Nature’s glory. No politics, no religion, no ulterior motives… just joy. The joy of life, of being, of seeing, of connecting to the universe. Indescribable… and the shortest two minutes of my life. 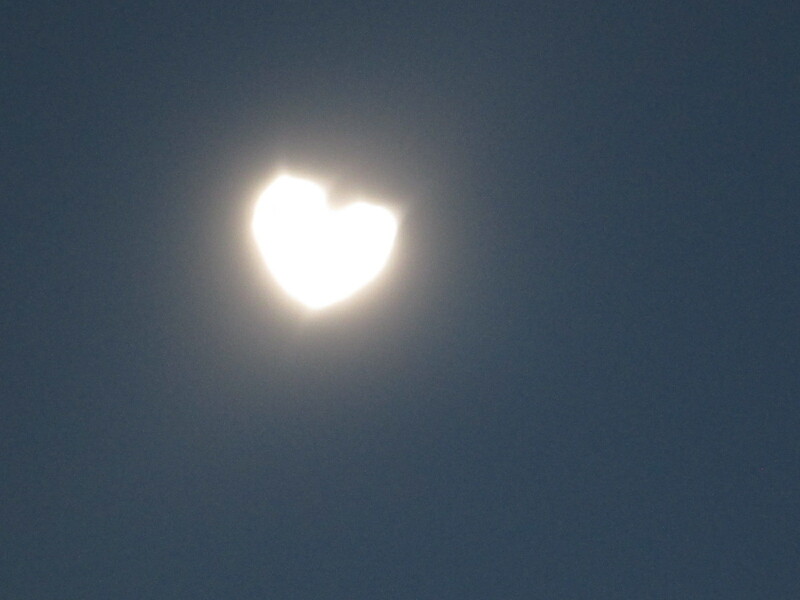 We Are Loved… serendipitous capture during the Total Solar Eclipse of 2017, due to trembling from the drop in temperature. 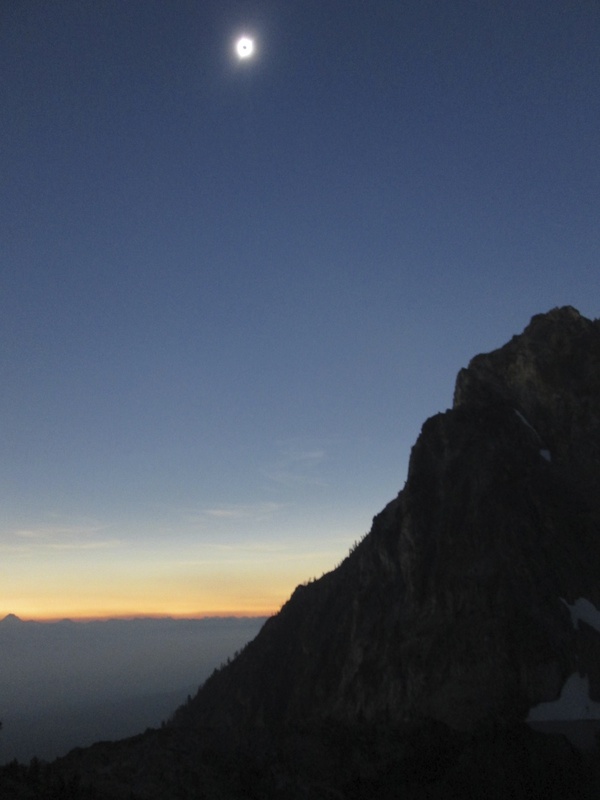 Following Totality, I returned across the rock outcroppings and rubble to my backpack. 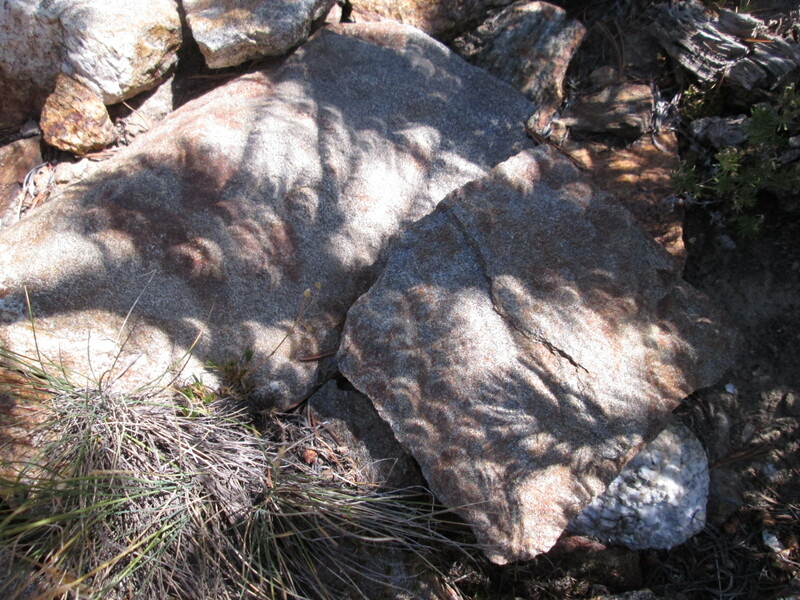 Now functioning on a high from the eclipse, I managed to get several images of crescent shadows and wildflowers along the way, although I could feel fatigue setting in. I arrived at my backpack to find my ground pad in full sun, which I was only able to endure for a few minutes. Searching in vain for another flat and shady spot to move my pad to, I gave up and sat down to rest on a shady log, near the campsite of some other hikers. Initially, I had planned to spend an additional night on the mountain, resting up before making the long trek back to my pick-up truck. I had ample food, and could now hike down to water’s edge to refill my bottles. This is when the realization hit me that, while everyone else was equipped with 21st century gear, I was hiking in 1970’s mode. It occurred to me that the people who said they filled their water bottles at the lake, probably had a filtration system… that the lake water was not necessarily potable. This was a problem. Now I was considering hiking back down immediately, because of that lack of water. About this time, hikers, from the campsite next to the log where I was seated, began arriving back from their viewing spots and we engaged in casual chit-chat. Discovering my water dilemma, one of them offered some iodine tablets to purify the lake water. We decided to meet at lakeside, where she would explain how to use the tablets, so I began my slow trek down the rocky rubble. As it turned out, she had also brought a HEPA filter, so she filled my bottles with filtered water instead, giving me the iodine tablets as well, in case I decided to stay for the extra day. 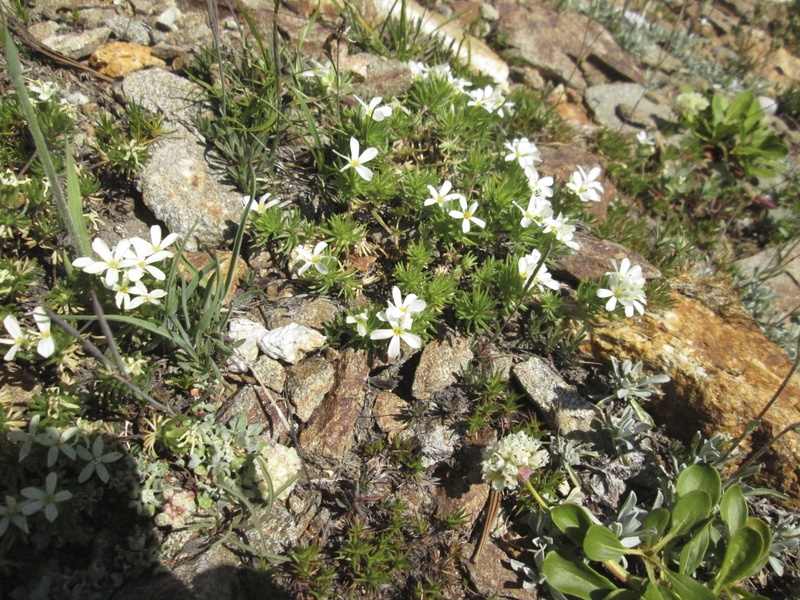 Her kindness turned out to be a true life-saver, as the hot and dry trek down would not have accommodated a dehydrated, blister ridden, snail’s pace hiker like myself. Of the three bottles she filled for me, I would drain all but one by the time I got back to my truck. Thompson Peak and Lake 9,000. 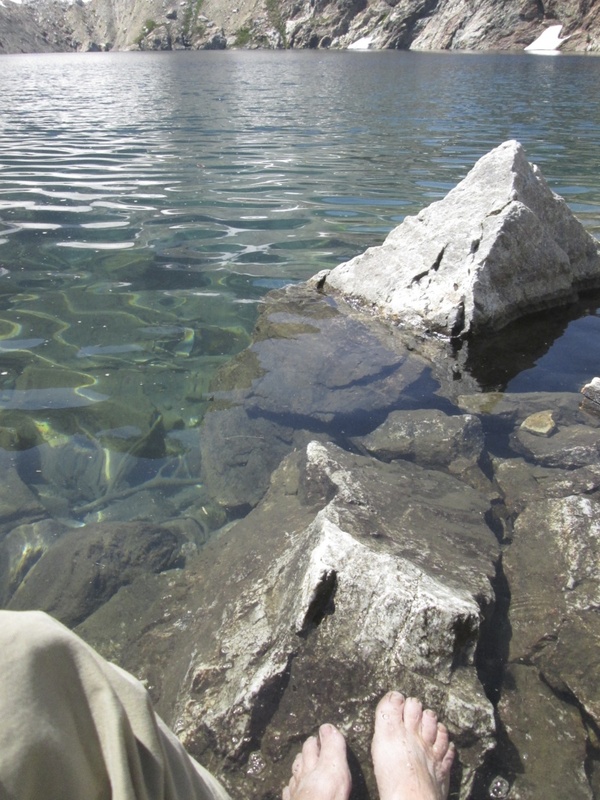 The water in Lake 9,000 is so clear it’s hard to tell that my feet are below the surface! While at lakeside I cleaned and soaked my feet. After inspecting the blisters that were taking up ever more real-estate, I decided I needed to treat them. I chose to carefully relieve the pressure on the biggest one with the only sharp item at hand… a green pine needle. This worked well and has had no complications. Next, I needed to dress the blisters. 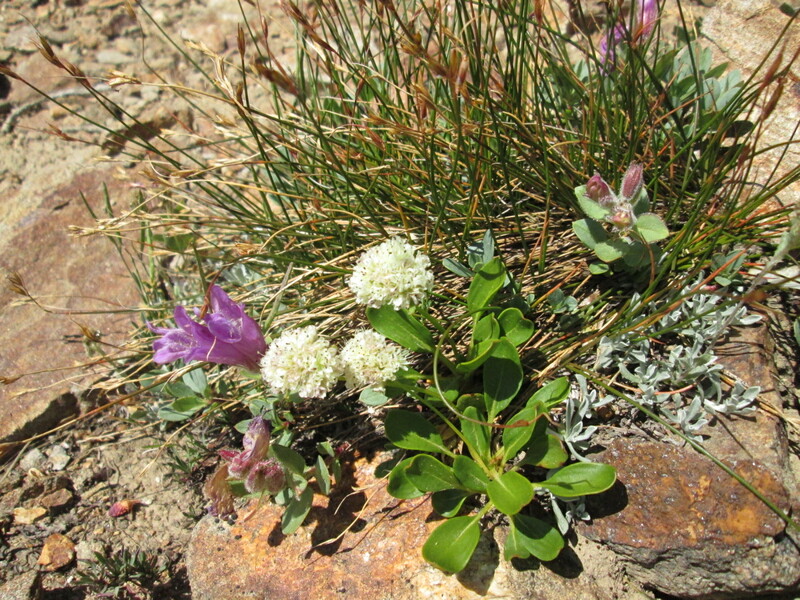 Earlier that morning, on the flank of Williams Peak, my medical tape had made a remarkable escape by popping out of my pack while I was digging for something else, and rolling far down the hill, seeking the nether reaches of the green meadow below. Who could blame it? What to do… donning my shoes and gingerly climbing back up from the lake, to my backpack, I pulled out some facial tissue and folded it carefully to fit the ball of my foot. Pressing this against the blisters, I wrapped it with a plastic label (from one of my water bottles) that had adhesive at each end, allowing the edges to stick to the top of my foot. This actually worked really well and remained in place throughout the rest of my hike. After the climb back up to my pack, and worn out yet again, I found a shady spot and laid down to rest. One of the neighboring hikers noticed me on the ground and became concerned. Aware of my age and obvious lack of conditioning, she wanted to be sure I was okay and had adequate supplies. Reassuring her that all was well, I thanked her for her concern. We discussed my options about spending another night, or heading down now, as her party was preparing to do. Like most of the people I encountered, she had a cellphone with her… I was amazed that she could get a signal at this location. She asked if there was someone I would like to call, just to touch base. I took her up on the offer and called my companion Al, back in Bellevue. After talking to Al, I decided to hike back down that day. It was around 3:00pm and I knew that the condition of my feet would make for some very slow going, so it was imperative that I make a decision right then. Each time I sat and rested, it was really difficult to get moving again, and I doubted that an extra day would see much improvement in my blisters, or my rapidly stiffening joints. Best to keep moving, while I still could. By leaving at 3:00, I felt I would have enough light to get back to my vehicle, regardless of how slow I walked… foolishly thinking the hike down would be easier, and faster, than the hike up. Besides, getting home Monday would give me an extra day to rest before making the 5 hour drive to Salt Lake City, which I had committed to a few days earlier. So I gathered my stuff, reorganized my pack, and set out down the mountain. Leaving Thompson Peak and Lake 9,000. Next stop… The Hanging Meadow. 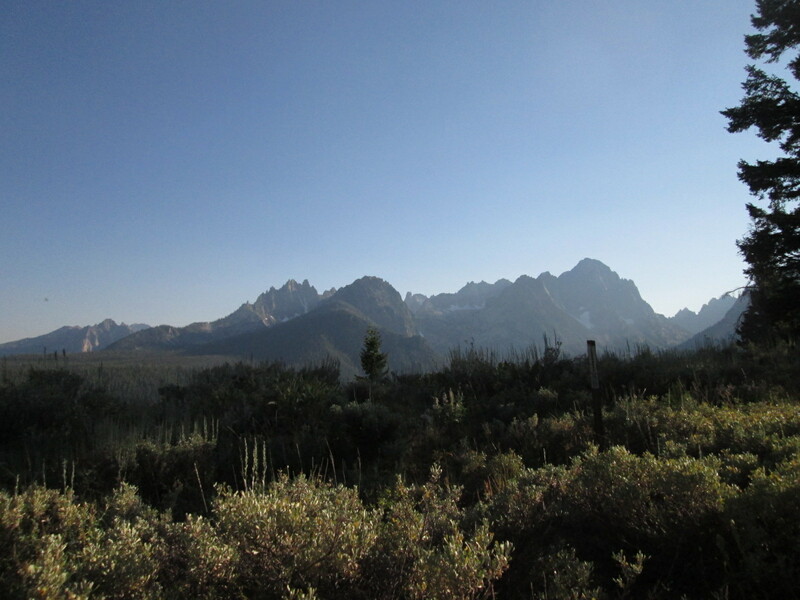 The Sawtooth Valley and The Whiteclouds… their white marble peaks barely visible through the smoky haze. I had planned to take lots of pictures on the way out, but didn’t anticipate the effects of fatigue. While I managed a few shots early on, it wasn’t long before the act of merely pulling my camera from my chest pocket, became exhausting. I now realized I would need every ounce of my strength and reserves just to get back to my pick-up truck. I had just begun the hike down and not only was I already exhausted, there was another problem… bad shoes. I had chosen to wear my most comfortable and broken in cross-trainers. Lightweight and flexible, they were good on the rock surfaces going up, but, coming down was a different story. Now, my toes were being crammed into the unforgiving plastic toe of the shoes, with every step. My gait reminded me of the Chinese ladies, from previous centuries, who indulged in foot binding. Creeping one tiny step at a time toward my destination, visible in the valley far below, and remembering the words of Chief Dan George in Little Big Man (“today is a good day to die”), I couldn’t think of a better place to wrap up my time here on Earth. I was neither worried or afraid, but I did have commitments to meet. So, at an excruciatingly slow pace, I made my way down the rubble field leading from the lake. 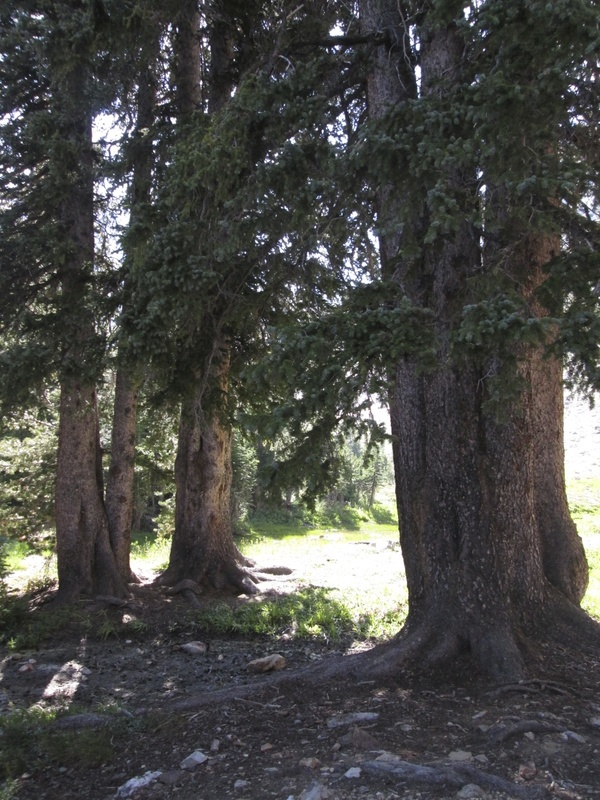 This stand of endangered Whitebark Pines has shaded the entrance to The Hanging Meadow for more than a millennium. 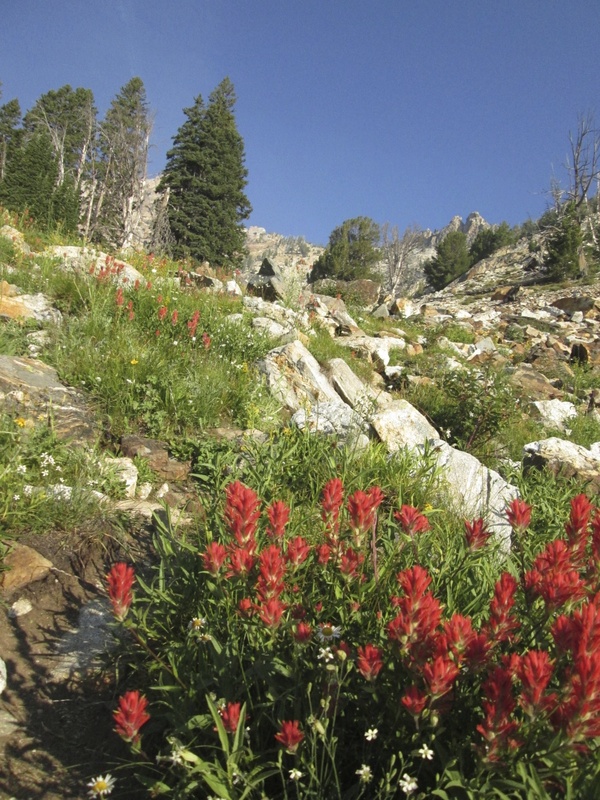 Arriving back at The Hanging Meadow, I took my pack off and rested beneath the ancient guardian Whitebark Pines that mark the edge of the lower talus slope. All too soon, and gathering my strength and determination, I resumed the descent. One of the cool things about moving so slowly is that the local inhabitants get accustomed to your presence. 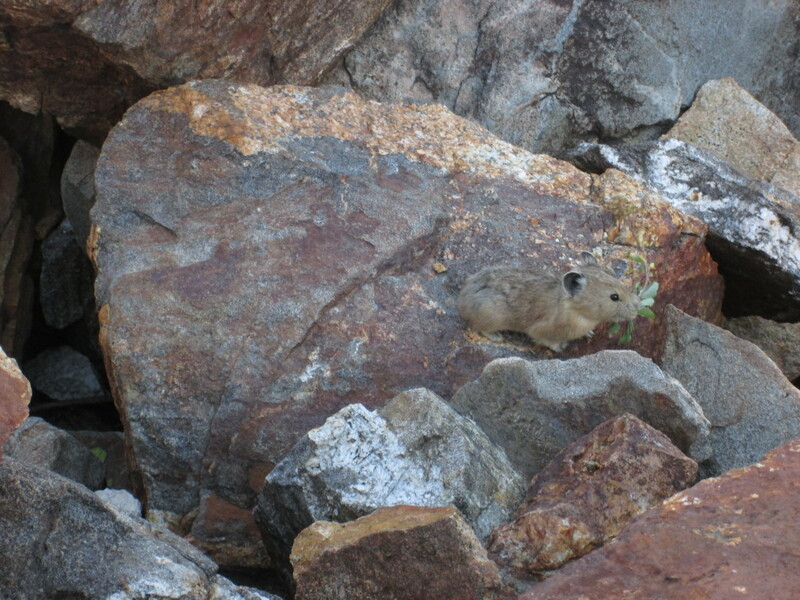 As I entered the intimidating talus, I noticed a bit of movement and discovered a pika (a tiny, endangered, alpine rabbit), carrying a bouquet of leaves and flowers to its den. It let me get quite close before darting out of sight… what a treat! Picking my way through the rubble, I spotted a couple of young hikers coming up the steep path. They were absorbed in the hike… not because it was difficult but because they were exhilarated by it. They were actually running up the trail and taking turns posing for pictures atop rocks, hands on hips, like Superman. The vitality of youth… when and where did I lose it? One of them spotted me, above them, and shouted out “Wow, you’re way up there!”. 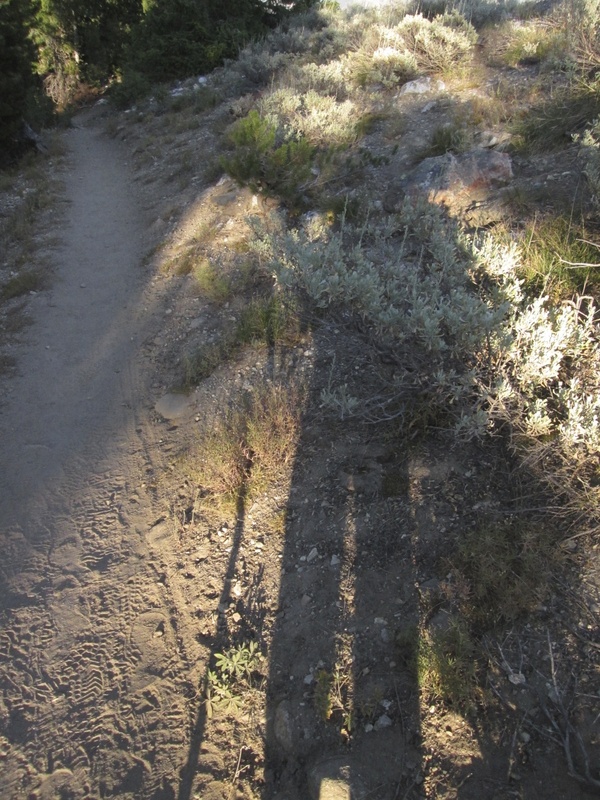 “I am…” I shouted back, “the trail through here is kind of multiple choice!”. “How old are you, may I ask?” he queried. “62” came my reply. “Wow, that’s very commendable!” he responded. Gradually, as he watched me slowly picking my way down, he grew concerned for my well being, asking if I was hiking alone. I said I was and promptly slipped on an unstable surface, catching myself in the nick of time. Laughing it off, so as not to worry him even more, I quipped “…good thing I’m quick on my feet!” all the while knowing how close of a call that had actually been. Decades ago, one of my high school pals had likened me to Strider (Aragorn), a ranger returning from travels with tales of adventure. Now, I felt more like Bilbo… wishing for his comfortable bed, ever so far away, in The Shire. As our conversation continued, the young man revealed that the second half of his party, the girls he was on this outing with, would be coming up the trail shortly. Their plan was to make the basin where Lake 9,000 is situated. 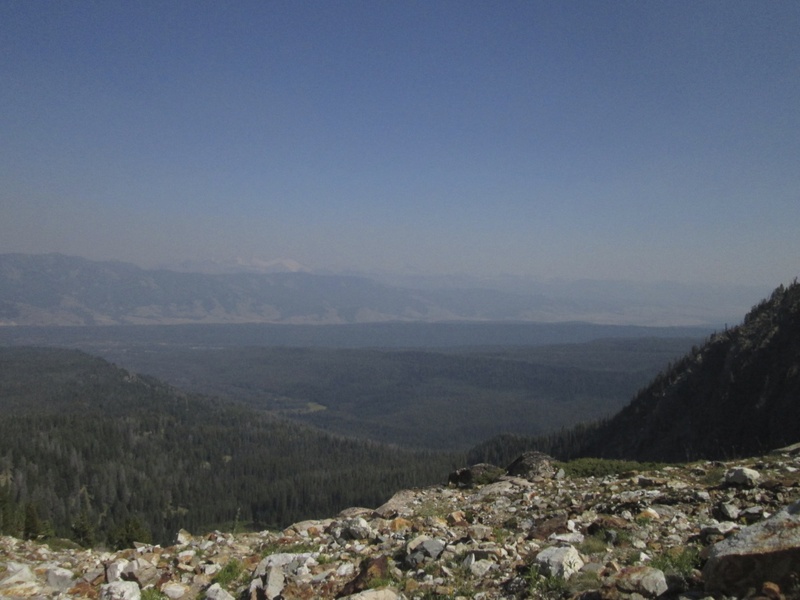 The boys would then hike to the top of Thompson, while the girls would turn around and go back down to Redfish where they would rendezvous with a ride back to their camp. He insisted that I should let one of the girls carry my pack, if they caught up with me on the return trip, and assured me they would not run off down the trail with it. “We’re Christians…” he proclaimed, “…we just want to help people!”. He advised that, should I get too tired to continue, I rest close to the trail so they could find me if it was dark. This, one of many compassionate exchanges I experienced on this journey, was very inspiring… reminding me, for the umpteenth time on this outing, of the goodness inherent in most people. In this world of dog eat dog selfishness and greed, such displays of selflessness are both refreshing and reassuring. It’s comforting to know there are still many goodhearted and generous folks out there. In the troubled future we now face, we will need all the kind souls we can find. Back on the gentle slope of the glacial moraine that Alpine Way Trail traverses, and off the steep flank of Williams Peak, at last! 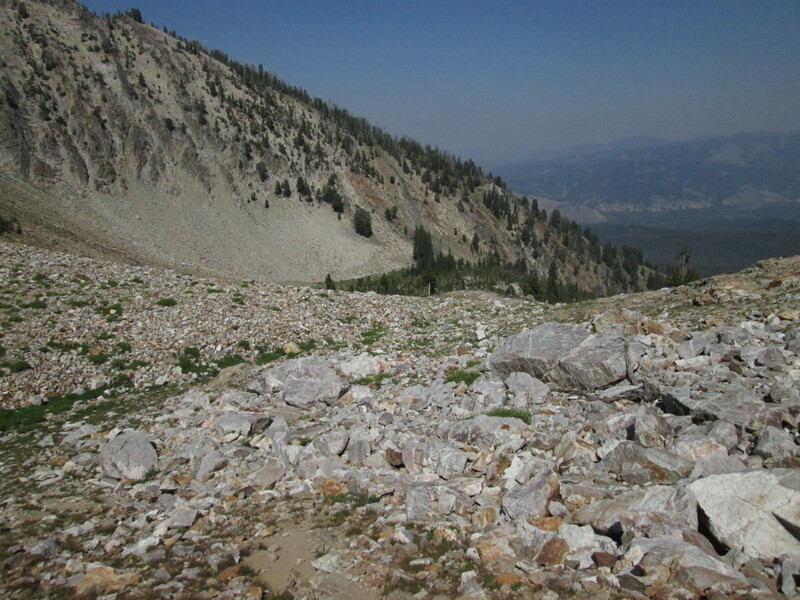 The hike down the flank of Williams Peak was tedious and trying. My blisters weren’t having it and my toes were cussing me every step of the way. It was slow going but I kept reminding myself that each step down the path brought me closer to my destination, while increasing the oxygen levels in my depleted system. Once I arrived back at the fork in the trail that led to Marshall Lake or Redfish Lake, the more gradual slope of the moraine made walking easier and I was able to pick up the pace some… I even managed to take a few more pictures along the way. I had just passed the Wilderness Boundary when the Christian girls caught up with me. By this time my back and shoulders had joined the parade of pain and, though it’s not my nature to depend on others to lighten my load, I must admit that I was hoping the offer to carry my backpack still stood. The smaller of the two girls, who looked to be barely in their twenties, offered to take my pack… which I gratefully relinquished, telling her I could carry it again soon. We set off down the trail, headed for civilization. We shared much about each other along the way, who we were, where we came from, our philosophy of life. Eventually I began to get winded from talking while walking. Although I said I was going to keep quiet for a while, I found this very difficult to do. Those who know me will not find that surprising… I like to talk. At the juncture in the trail that would lead to the Redfish Lake trailhead, where the girls were going, we had a miscommunication. They were to be picked up at the horse corrals near the trailhead, but they knew my destination was a few miles beyond this fork, down to the trailhead at the SNRA Ranger Station. I had already decided to go with them to Redfish, and then hitchhike to my vehicle, but somehow we ended up taking the fork to the ranger station. About a half mile along I realized the mistake and, with darkness now encroaching, I knew we needed to turn around and go back up trail. With the patience of Job, the two girls headed back up with me. Incredibly, they had been willing to selflessly walk the extra distance back to my pick-up, even though it was miles out of their way. By now we were well into dusk and my fatigue and distress, over the backtracking, were becoming apparent. I forced myself to talk as little as possible but my exasperation over the loss of time, and the extra effort, inspired periodically whispered exclamations of “oh, boy”, which were not lost on the girls. The taller of the two ran ahead and scouted out a shortcut to the trail we had missed, then they patiently guided me through the deadfall littered sage and back onto the right trail. Success at last! We had finally made it to the bottom of the moraine and now the trail was wide and smooth. Darkness was falling, allowing us just enough time to reach the paved road before the last vestiges of light vanished. The girls had been trying, unsuccessfully, to call their ride to pick us up. I decided to hitchhike to my truck, after all, and would return to give them a ride to their camp. My young Christian friend had carried my backpack all this way, only now relinquishing it. Re-shouldering the pack, I headed down the road into the darkness. As I stood alone by the roadside, waiting for a car to come by, the two girls came running up saying they had contacted their ride and it would be there soon. Yay!!! Moments later I was back at my truck and hugging my Good Samaritan saviors goodbye. They had been having a hard time reaching the boys back up on the mountain, and I do not know if they made it down safe and sound. My prayers were, and are, with them… and they have all been on my mind ever since. I’m not sure if it’s from age, lack of oxygen, or depleted brain cells, but I cannot remember the names of any of the kind souls who helped me along the way. With the exception of one… the tiny little gal who carried my pack. Her name is Lorina, or maybe Laureena. Thank you, Lorina/Laureena, and everyone else, from the bottom of my heart. Your kind acts were more than helpful… they were food for the soul. With hunger and fatigue now setting in hard, I chose to drive the few miles north to Stanley, rather than brave the hour drive south, over Galena Summit, to my home. By now it was around 10:00pm and I was far too tired and shaky to risk an encounter with a suicidal deer or elk. The 3 mile drive to Stanley was all I had left in me. I grabbed a veggie pizza from a local pizza joint, found a place to park my truck, crawled into my bed in the camper, and slept off my exhaustion. The next morning dawned bright and beautiful. Now, much more rested, I safely made my way home to Bellevue. Over the course of my life I have not traveled far and wide, but I have traveled well. Confining my wanderings to the western US, I have managed to experience much of what this beautiful region has to offer. 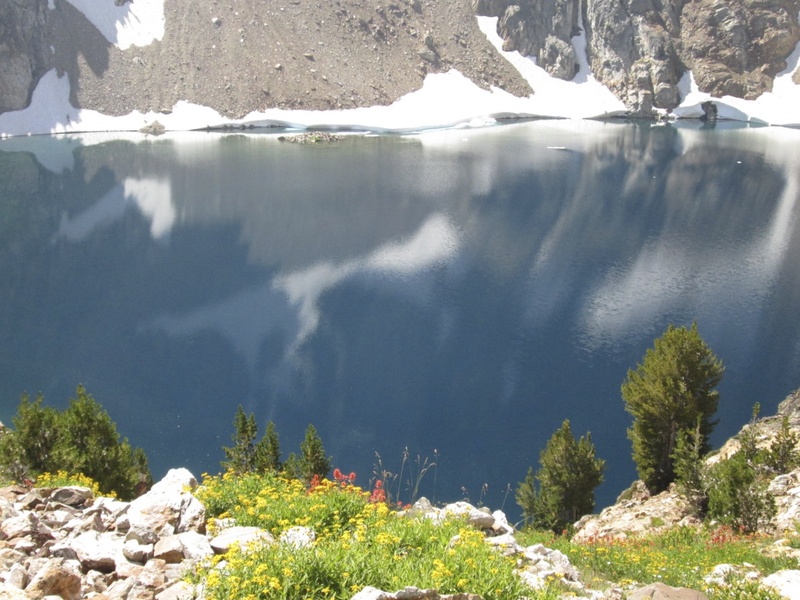 I have a fair bit of experience in the Sawtooths and surrounding mountain ranges, with my first hike to one of the local alpine lakes (appropriately named Alpine Lake) being when I was 16. It was July of 1971 and I was visiting my mom, and new step dad… they had moved to Stanley following their recent marriage. Coming from the sweltering summertime purgatory of Porterville, in the bowels of California’s San Joaquin Valley, the Sawtooth Valley was paradise. I was smitten by its beauty and have lived here, and/or visited, time and again over the years. As my grandparents liked to say, in regards to love, “there’s no fool like an old fool” and it was certainly love of this place that set this old fool on this unlikely, and somewhat foolhardy, journey. 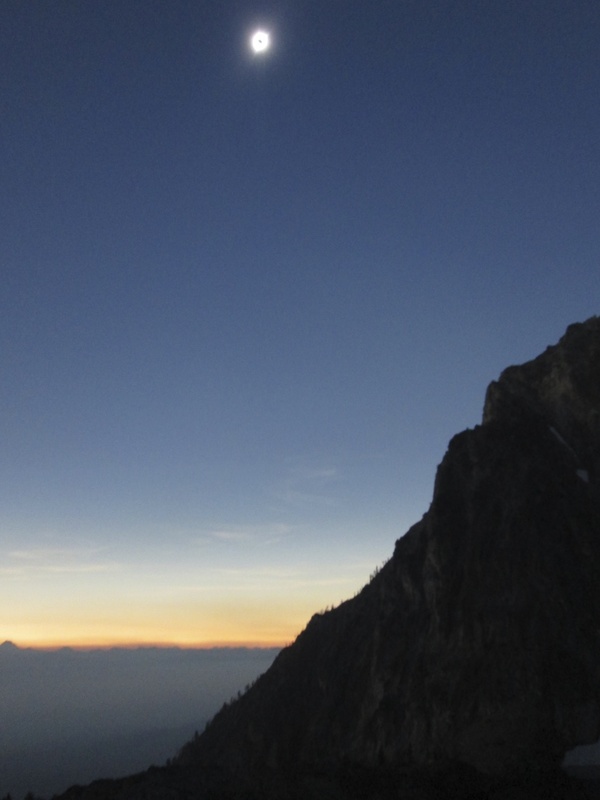 This was more than a hike in cherished mountains, more than the chance to experience a unique celestial event. This was a journey of the heart and soul. I could have stayed in the comfort and luxury of Sun Valley to experience Totality, but was drawn back to my youthful stomping grounds. I followed my heart and completed a lifelong journey that I didn’t even realize I was on. A wanderer, I have always been… casting my fate to the wind in the trees, the laughter of water ricocheting from rock to rock or tumbling from pool to pool, graceful animals grazing in peaceful meadows, granite peaks consuming the horizon, austere desert landscapes. These things have lured me to many magical places, but I never really understood the impetus of it all… what it is that compels me to experience the land. I get it, now. It’s love. Pure and simple. Love of life, love of creation, love of being a part of it all. This planet is a miracle beyond comprehension and I love it with every particle of my being. When I witness mankind’s destructive presence, my heart breaks for the innocents who suffer our insensitivity and selfishness. The dire environmental situation our species has caused, which threatens to spell extinction for nearly all life as we know it, shatters my soul. There are no words for the depth of my heartache over the ongoing climatic and environmental catastrophes now unfolding on our beautiful Earth. 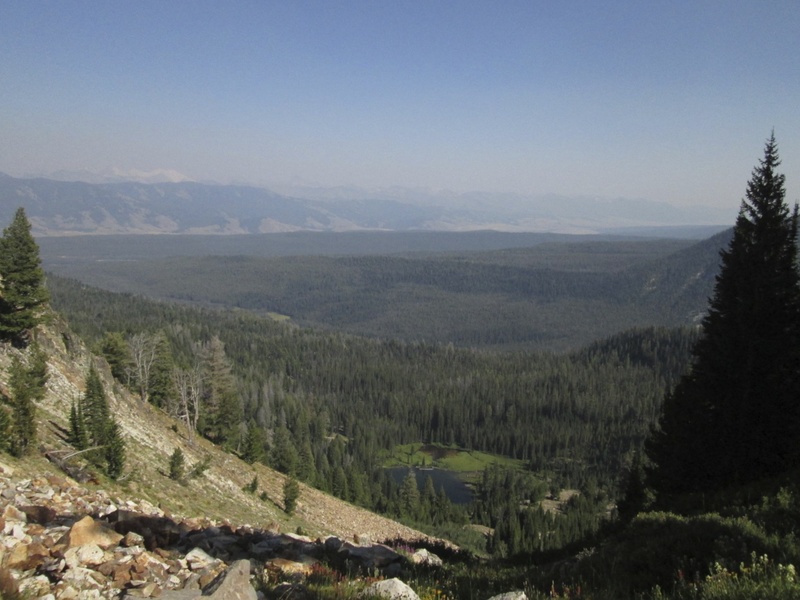 I was already well aware that the forests of the Sawtooths were suffering… the effects of pine beetle infestation, which surged far beyond normal levels over a decade ago, have made the devastation painfully obvious. Rampant forest fires, massive burn scars, countless acres of standing dead waiting to burn. These things can be seen from the road or from satellite imagery. What cannot be seen, from a distance, are the changes within the ecosystems. The diminished amount of birds and insects, the reduction of native mammals and fish, the silence of the woods, the ability to weather a breezy night at 8,700 ft. with only a ground pad and a couple of fleece throws. These troubling signs of a warming climate brought the tentative nature of our presence, on this planet, resoundingly home to me. It’s one thing to read of eco-problems in distant places, and to have empathy. It’s another to experience those changes in person, where they are an in your face, undeniable reality, consuming your most cherished places. Although not visible in any of the pictures from my hike, Redfish Lake sits nearby, in a glacial trough between the Sawtooths and the Salmon River… the two moraines it rests between can be seen in previous images overlooking the Sawtooh Valley. Mt. Heyburn looms above Redfish Lake. A closer look at the western shore of Redfish reveals a forest in trauma. Redfish Lake, East Shore Trail. Humanity has such short term memory, our lives moving rapidly and haphazardly through the slower, long term processes of the natural world. We, too often, fail to witness the slow evolution carrying on around us. We are here… and gone. But the world that suffers the repercussions of our actions remains, continuing to be affected by acts long since forgotten. For us, if it’s not in our present, it doesn’t exist. We just forget about it and move on. We are, without doubt, the most irresponsible creature to ever walk the face of this Earth. The brief term of our individual lives is the bane of our species. It blinds us to the true nature of time, an entity of enormous scale and complexity, that far outstrips our ability and willingness to comprehend and adhere to. We are, here and gone. It is well past time that we slow down and fit back into the pattern from which we emerged. Speed kills, and it is killing this entire planet, right in front of our faces. 43 years may seem like a long time to some, and not so much to others… in the big picture it is barely the blink of an eye. For me it represents many lives. Awkward teenager, finding her way. Young wife, starting a family. Widowed mother, starting over. Older, but not always wiser, senior citizen. Through it all, I never lost my wanderlust… and now I know why. It was so I could complete my journey. So I could be re-inspired by the kindness of strangers. So I could remember who I am and what I am about. So I could renew my dedication to the miracle that is this glorious planet and to help her, in whatever small way that I can, survive the presence of mankind. In that light, I would ask everyone to go out and experience Nature. Get outside and observe the inter-relationships of the living world… in the wilderness or in your own yard. Non-human life goes on around us, often in spite of us, and much can be learned about where we now stand by the status of, and behavior within, the niches that survive in our presence. 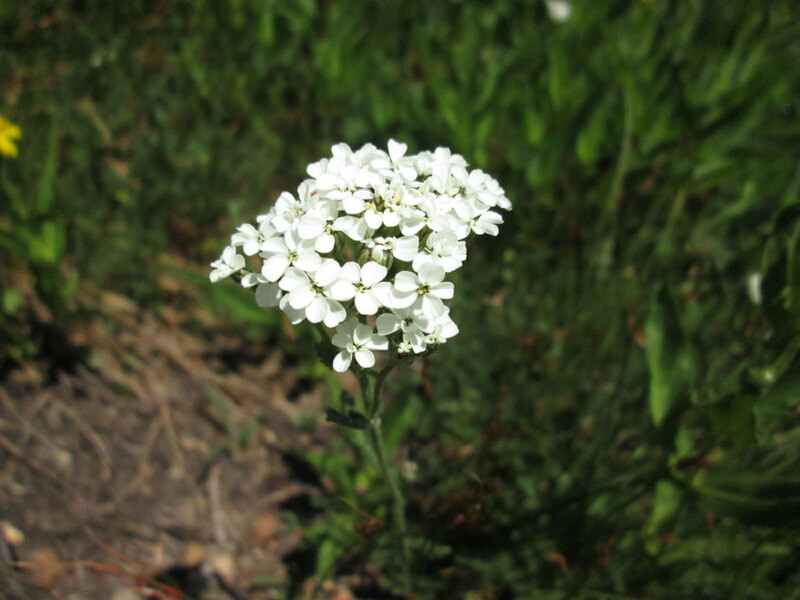 The changes in variety and type of plants and animals in our own yards, reflect larger changes in wilder areas. Observe the living communities around you and you will see those changes. They are happening ever more rapidly and are not difficult to spot. Then, get to the wilderness and observe it. Compare what you see there with what is happening at your own home. This will help you more fully understand the avalanche of disruption destroying the balance of Nature… a balance required to sustain life on this planet. And, while you’re out there, take a long deep swig of Mother Nature’s tonic… it’s good for the soul and disappearing fast. After that? Join the legions of people who love the miracle of life that is this planet, who understand the dire predicament we now find ourselves in, and, who are ready and willing to change the paradigm. If we hope to save our own butts, and the innocents who had no part in the desecration of Earth, we must hurl ourselves headlong into a new reality… immediately. We must extract ourselves from the techno-prison we have created and return to the simple path. I realize that most people are ill equipped to live without the many conveniences we now depend so heavily upon, but, we really have no choice. We must dispense with the techno-industrial demon looming over us, and seek a more balanced way, before it’s too late. Unfortunately, it is already, very nearly, too late. We were warned, around 50 years ago, that our future would be impacted by pollution, environmental degradation and global warming and were encouraged to begin making changes in lifestyle, then. Some didn’t believe the data, others refused to even look at it. Most just carried on with business as usual, expecting that the “powers that be” would deal with our environment responsibly. Obviously, nothing could have been further from reality. The “powers that be” care not for the health of the planet and the balance of Nature… their only care is their profit margin and ability to wield power and control. Nonetheless, we all trusted that those with the wherewithal would do the right thing. So we dawdled… and dawdled, and dawdled until we had slipped right on past the point of no return to a biosphere that resembles the one my generation grew up in. That point was nearly two decades ago. Sadly, the planet will continue to decline for decades and generations… maybe even centuries or millennia depending on how quickly, or even if, we change the paradigm. The world as we know it is vanishing before our eyes, bound for The Grey Havens of our memories… never to return. We are now on a salvage mission and must focus on preserving whatever we can of the natural world, relinquishing our techno-dependency, if there is to be any hope for a viable future. Every mass produced petroleum product, every handheld device, computer, automobile, airplane, TV, ATV, plastic container… every industrialized product you can name extracts life from the biosphere, replacing it with toxic waste. Including industrialized agriculture. When production of those things is multiplied by the demands of an ever growing global population, racing toward 8 billion, the result spells catastrophe. That catastrophe, the unraveling of all aspects of Earth’s delicate, life sustaining balance, is well under way. This situation cannot be overstated and must be dealt with immediately if we hope to survive at all. Join us, the invisible army dedicated to preserving a future for life on this planet. Each doing whatever they can, in their own way, to find a better way and to stave off the industrial dragon consuming us. We may not win this war, but at least we will go down fighting… fighting for our lives, for the future, for the innocents, and, for what remains of mankind’s honor. I know you are out there, you brave souls and compassionate hearts… I met you along the entire way of my short journey. Now is the time, my friends… now is the time. Sauron is watching, the Nazgûl are circling, and the battle is at hand. Mankind’s impacts are not purely accidental, nor simply incidental. We exist in an era where Nature, weather included, is manipulated intentionally… in a futile attempt to bend her to our will. 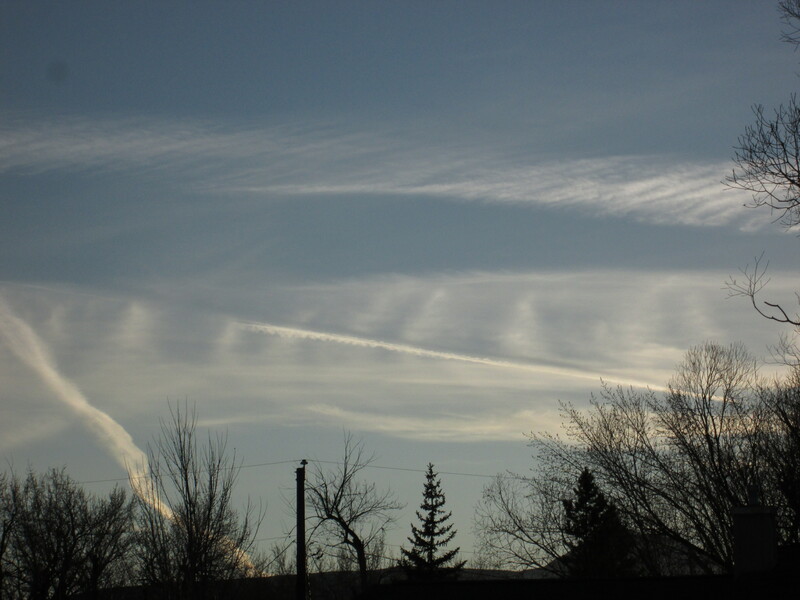 SRM, aka Solar Radiation Management, is one example of this meddling. Its proponents claim that it has not yet been implemented, but a little research (and time observing the sky regularly) reveals otherwise. Intended to imitate the cooling effects of a large volcanic eruption, those pushing this particular techno-fix downplay the fact that the cooling is temporary and relatively brief. 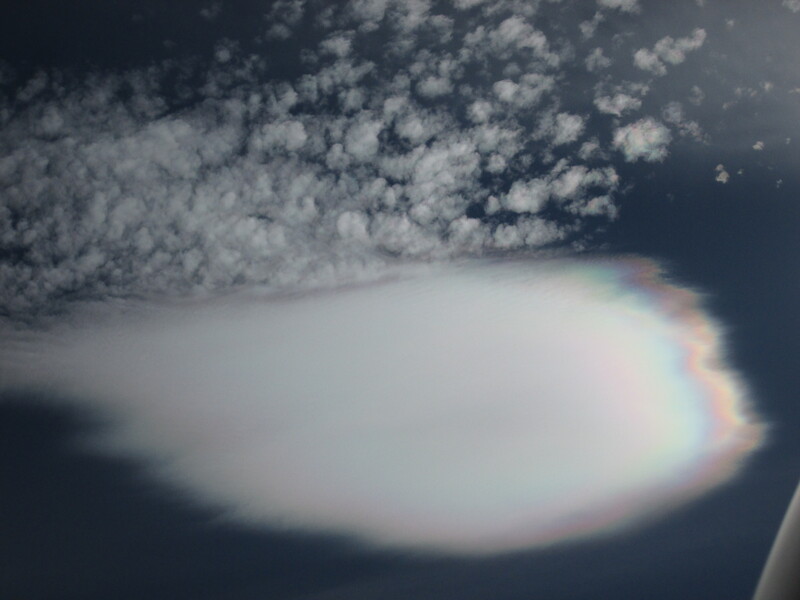 They also avoid revealing that the injected SO2 aerosols, used to mimic the effect of sulfur dioxide introduced into the stratosphere by certain types of volcanic eruptions, react with chlorine and other chemicals at altitude. This depletes the fragile, ultra thin, stratospheric ozone layer that protects the surface of the Earth from UV radiation. The result is warming that not only outstrips any temporary cooling, but, subjects life to the damaging effects of excessively high UVs while depositing toxic pollutants back into the biosphere… all with undesirable side effects. Worse yet, when that thin veil is gone, and it is currently fading fast… when that thin veil is gone, life on Earth is finished. A wing and a prayer… and a backdrop of intentionally dispersed SRM aerosols, as our opportunity to change the paradigm grow ever slimmer. 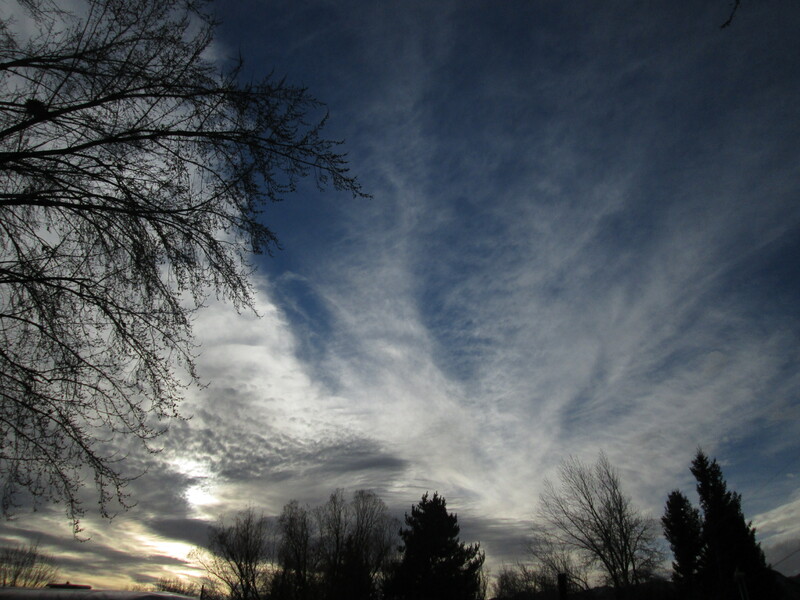 Among the many undesirable side effects of artificially generated particulate cover is altered pH in soil and water (contributing the the weakened, distressed condition of forests and difficulty gardening organically), as well as toxins like aluminum, barium, strontium, etc, accumulating in air, water and soil. This is not a logical approach to the climate issues we face… techno-fixes serve only to complicate and/or exacerbate the many, already complex, environmental catastrophes now unfolding. At best, a techno-pharma approach to climate may yield short-term relief, but the damage it inflicts far outweighs any short-term benefit. It’s like putting a bacteria laden band-aid on a bullet wound… not only grossly ineffective but, life threatening in its own right. 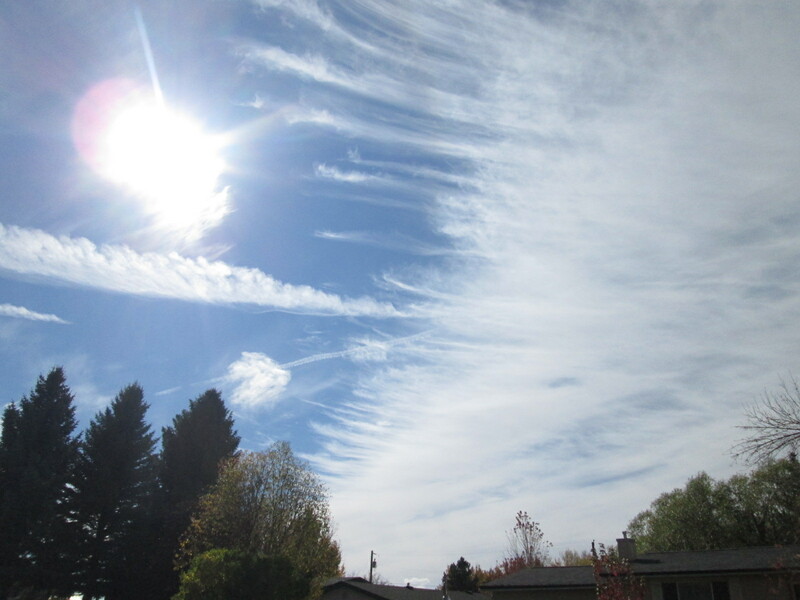 Among the many things we can do, to slow our descent into darkness, is to cease and desist intentional abuses such as the climate engineering “dirty bandaids” of SRM (Solar Radiation Management), SAI (Stratospheric Aerosol Injection) and SAG (Stratospheric Aerosol Geoengineering). Educate yourself on this topic (informational links below), then join the battle to save Spaceship Earth… in this sea of desperation, where we now find ourselves adrift, she is, and has always been, the only boat afloat. Please visit GeoengineeringWatch.org to learn more about the consequences of SRM, and ways that you can help. Wow, thank you for such a compelling story and heartfelt words! Thank YOU, for being willing to plunge into such a long offering! And, thanks so very much for the kind comment… much appreciated!